This walk was always going to be a long one but, in the end, it turned out considerably longer than I expected. 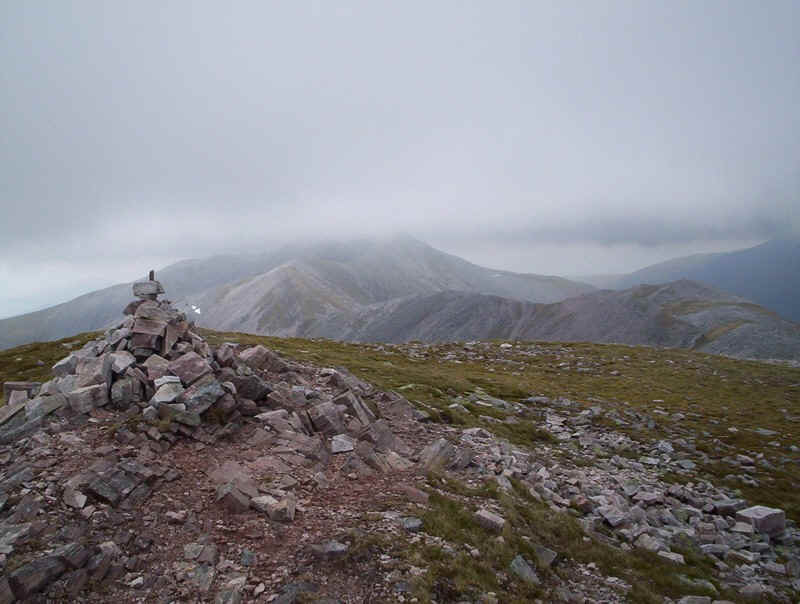 The plan was to take either a taxi, or the bus, up Glen Nevis, climb Sgurr Choinnich Mor and then continue along the Grey Corries ridge to Stob Coire an Laoigh and Stob Choire Claurigh and, finally, climb Stob Ban before walking back to Spean Bridge. A BIG day! 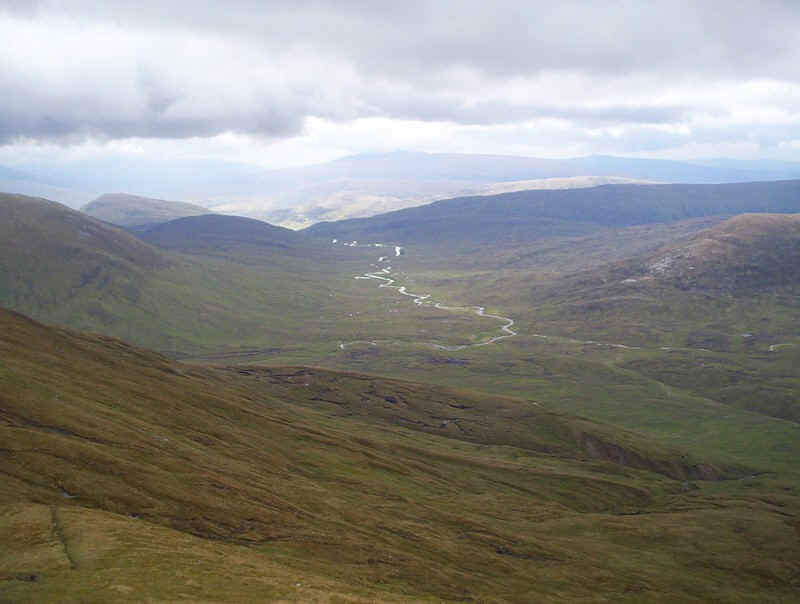 Now the Cicerone guide 'Walking the Munros: Volume 1' suggests that the expedition from Glen Nevis to Corriechoille should take about 8h 15mins for the 23km. 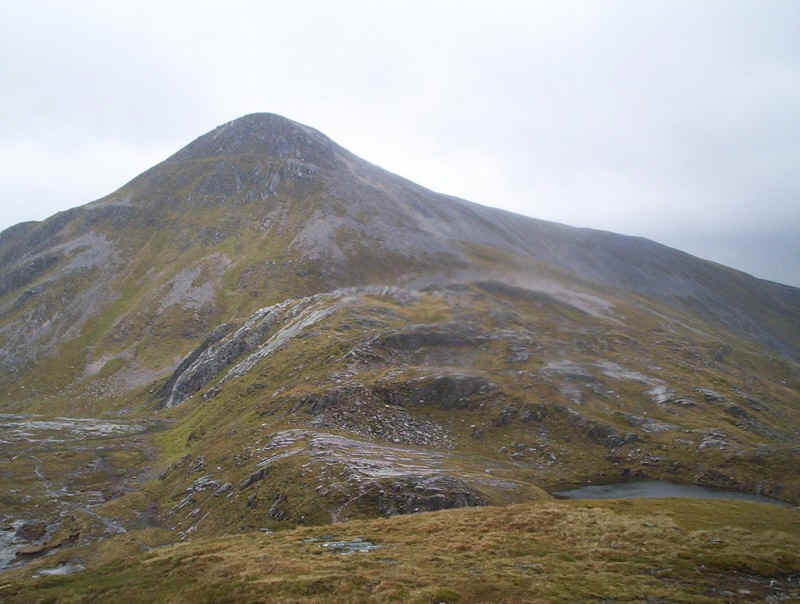 Since I was going to be walking from Corriechoille I added about another hour to this plus an extra hour for photo stops and food breaks giving me just over 10 hours. 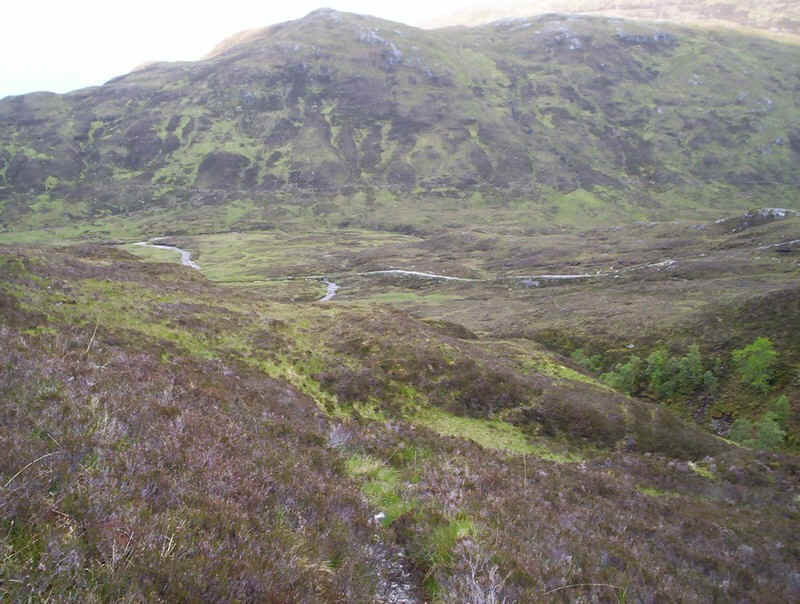 In the end the taxi won and I paid £11 to be deposited at the Upper Falls car park in Glen Nevis at 8.20 am one June morning in 2011. 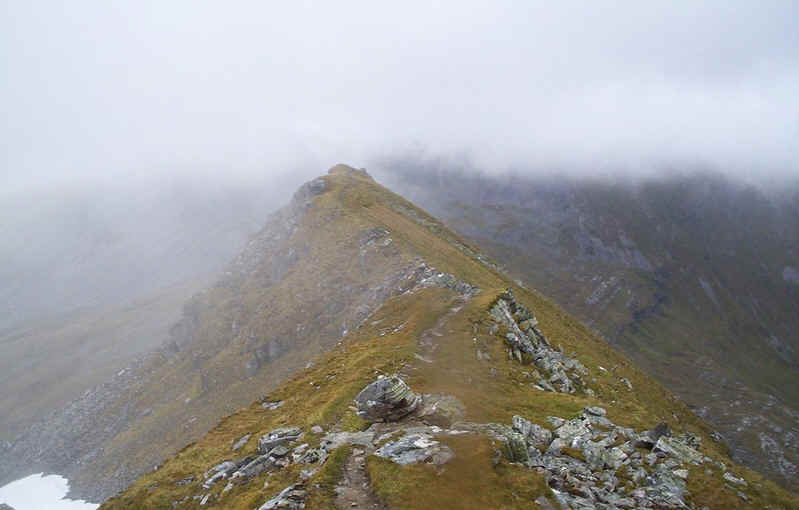 It was just as well that I didn't wait for the bus an hour later, because the walk took 12 hours and I had to abandon plans for climbing Stob Ban. Just who are these supermen who can do this walk in 8h 15mins? 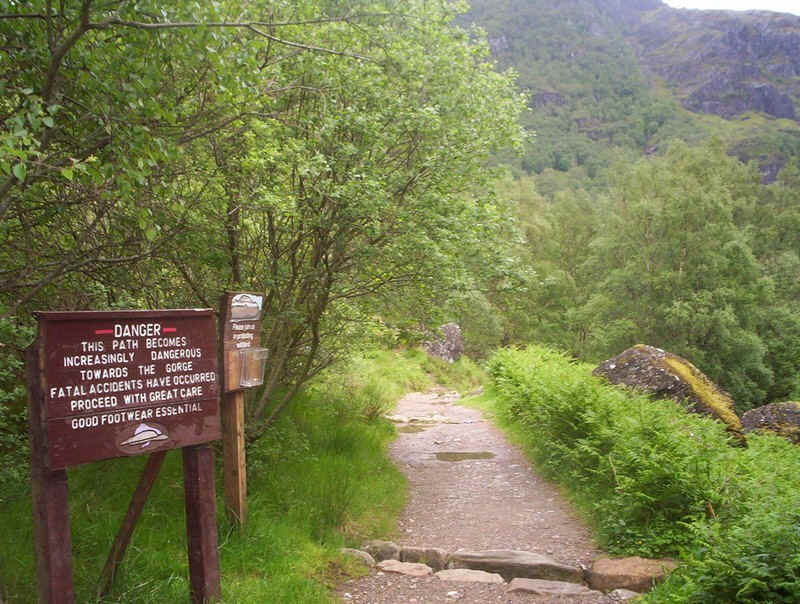 The walk starts from the car park with this very serious warning sign, which is justly deserved by the path through the gorge. 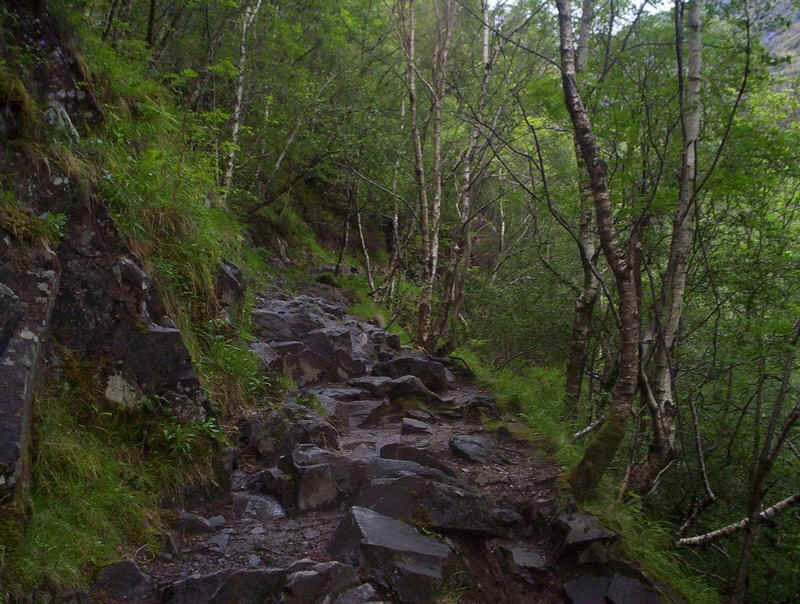 ......but soon becomes rocky and over slippery rock, sometimes with serious drops. In Switzerland this would have fixed cables anchored to the rocks and I can't help thinking that there should be some here. 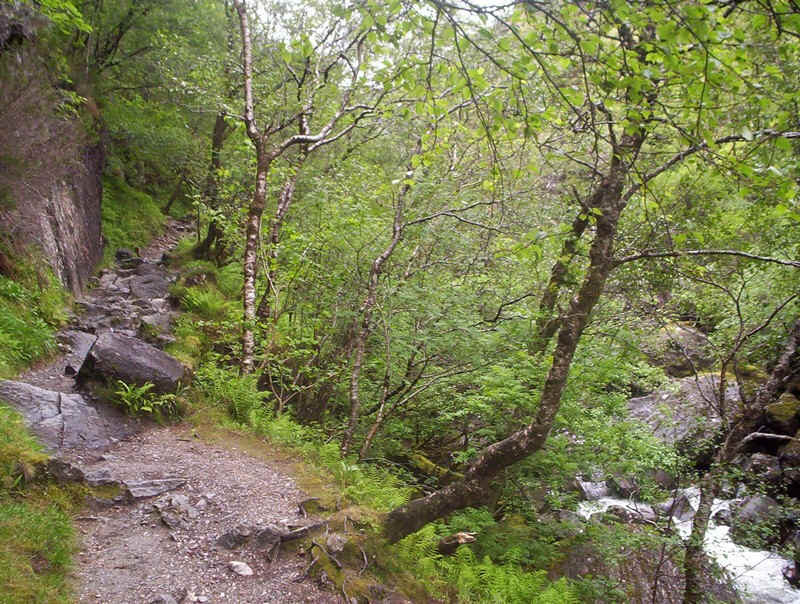 The gorge is difficult to photograph because of the trees but these give an impression of what it's like. 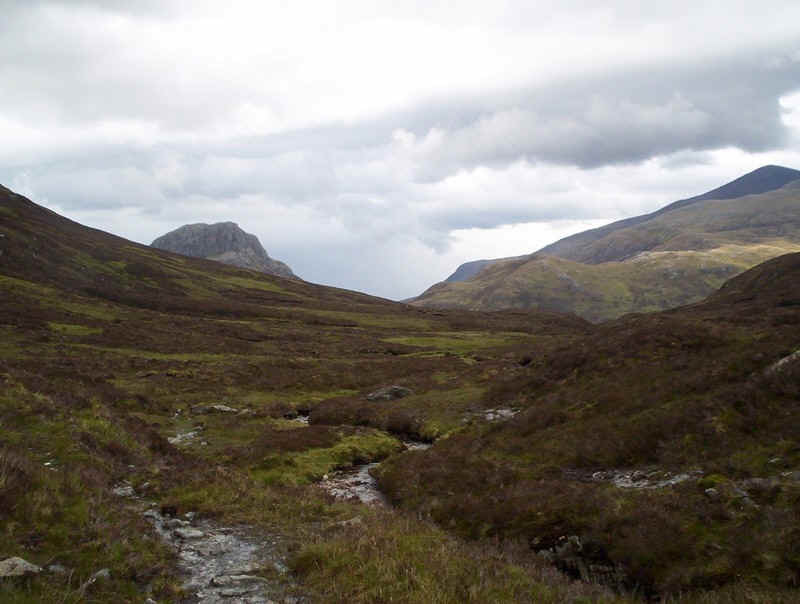 Once beyond the gorge, the glen opens out and the path becomes a delight to walk along. 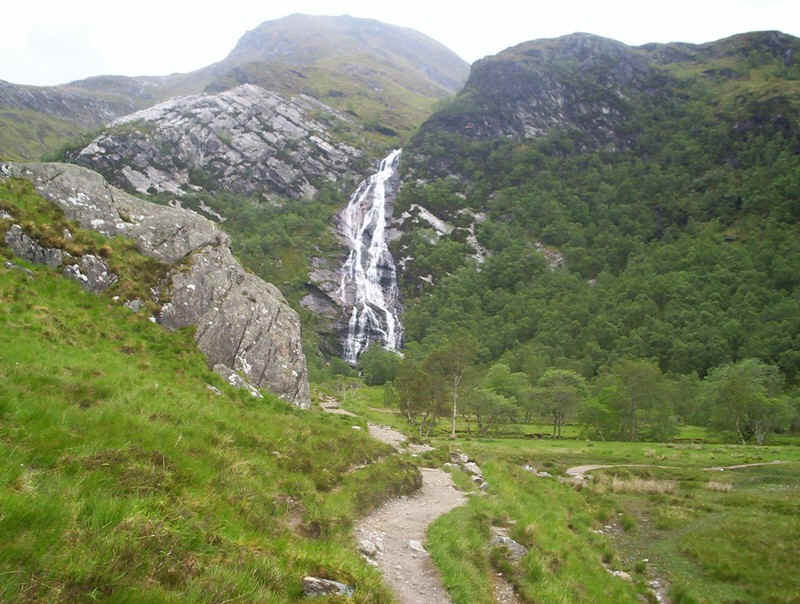 Here the Steall Falls cascade down in front of the Munro, An Gearanach. The famous wire bridge across the Water of Nevis is enough to set pulses racing. Fortunately, I didn't have to cross it although. 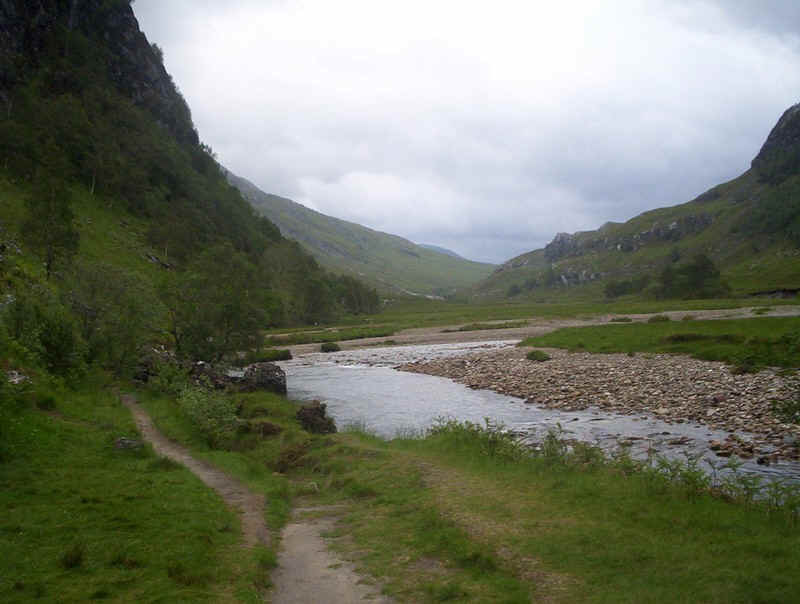 on a previous visit to the Glen, when we wanted to cross from the other side I was half way across when I was summoned back. Don't try walking backwards across this bridge especially when you have to step off onto the rocks at the other side! I wonder why it hasn't been replaced with a proper bridge with boards as you find elsewhere? 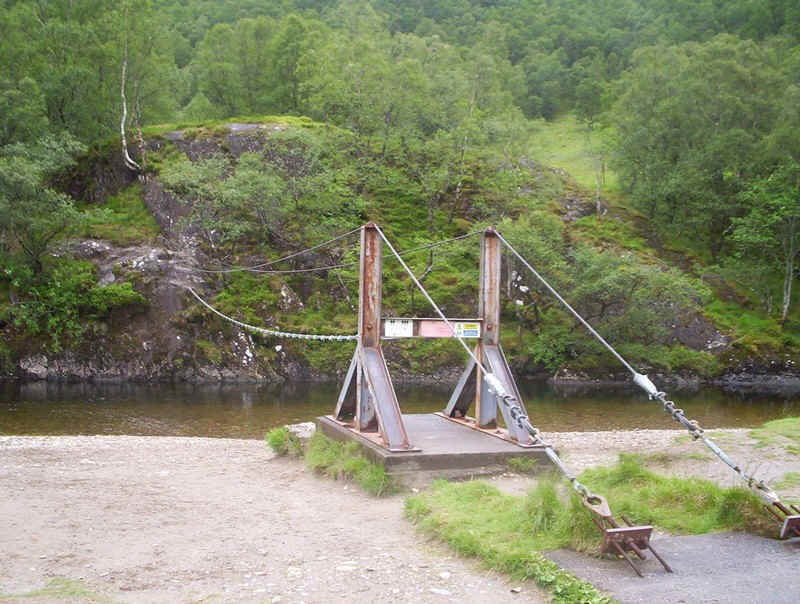 Presumably, it's in case the river rises so high that the bridge would be swept away, or is it just macho Scotland?! 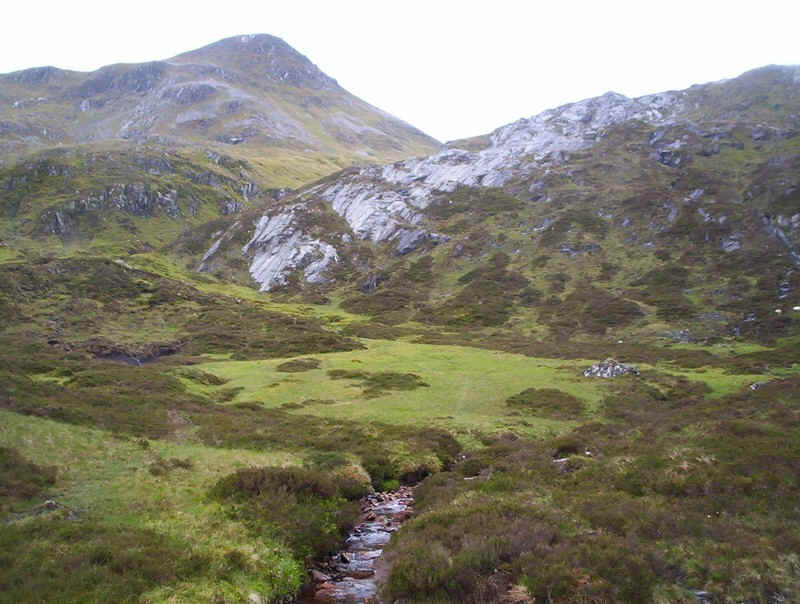 For those who don't wish to cross the bridge, apparently, you can always ford the Water of Nevis further up stream, but today my route lay up the glen. 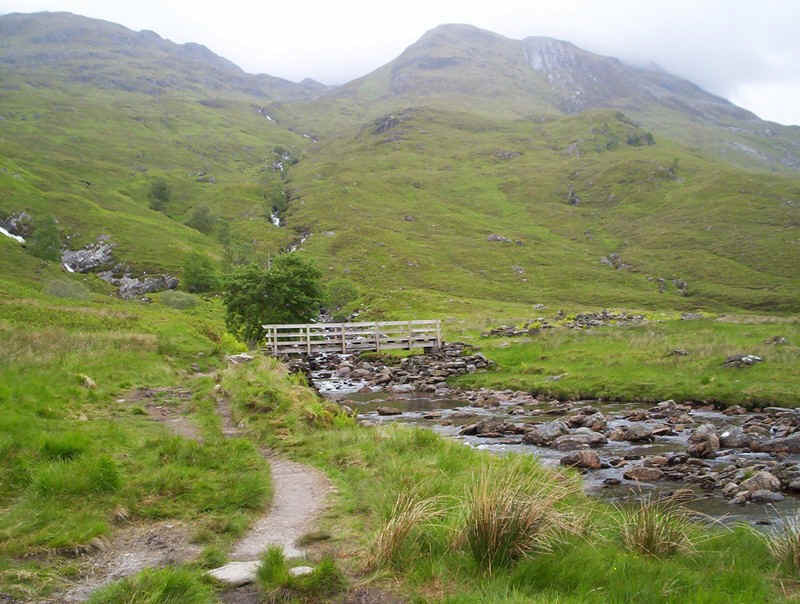 ... the Steall bridge, with Aonach Beag towering above. Beyond the bridge the path begins to climb high above the river. 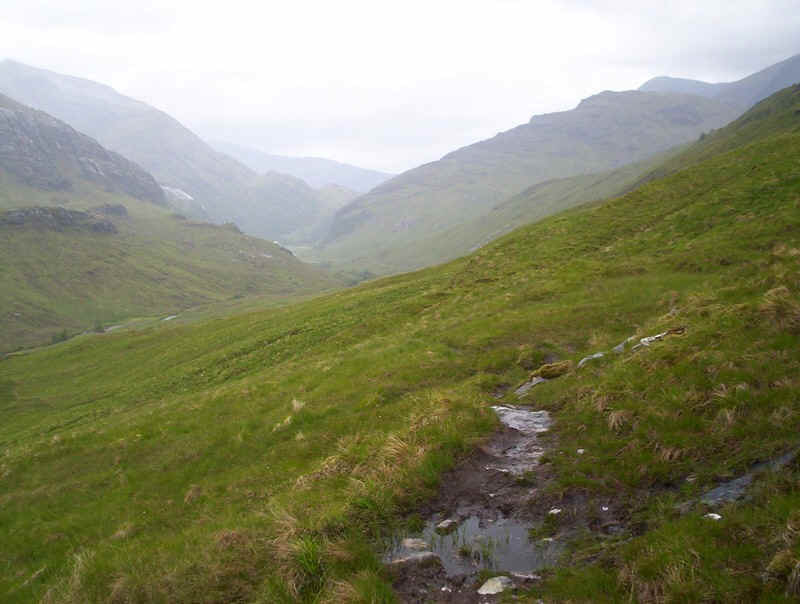 Looking back down Glen Nevis with the slopes of Ben Nevis at the top right. 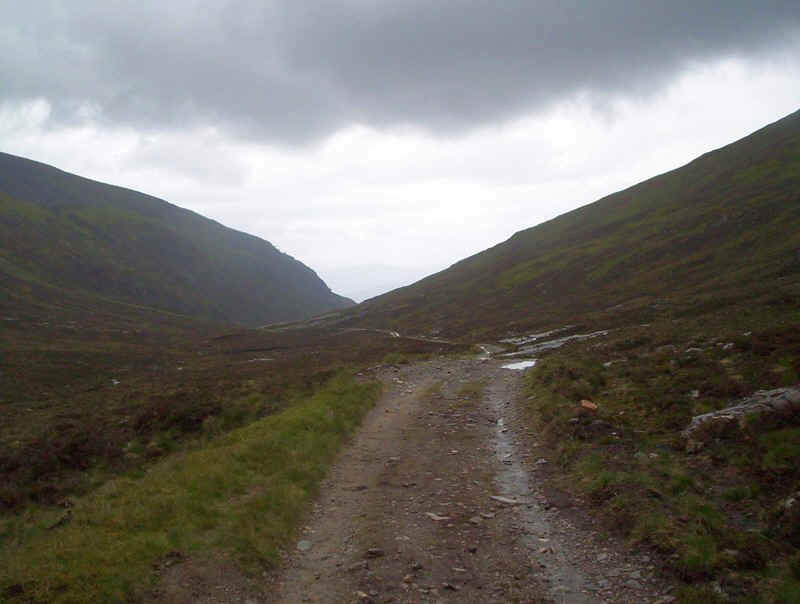 Where the path up the glen crosses the Allt Coire a' Bhic there is a track that runs on its west bank, heading for the col between Sgurr Choinnich Beag (seen in the mist) and Aonach Beag. 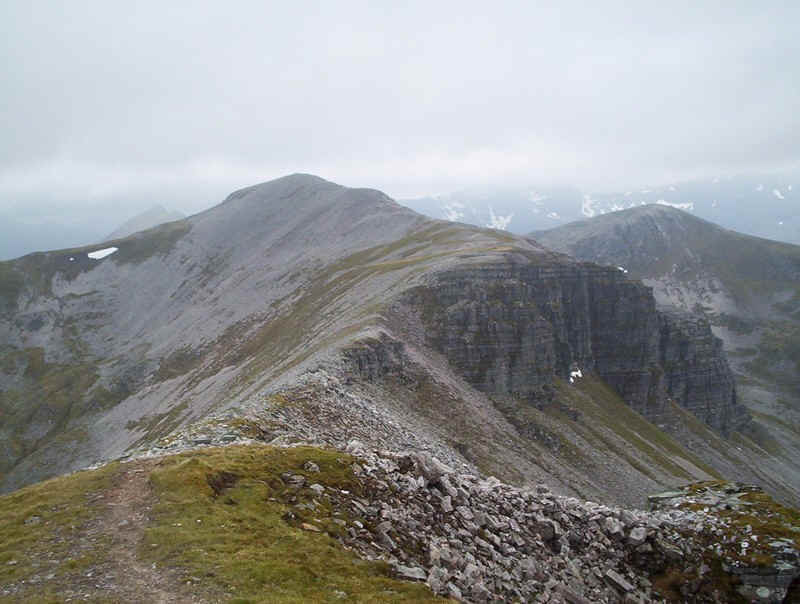 ......until it petered out near the col. Aonach Beag is to the left. 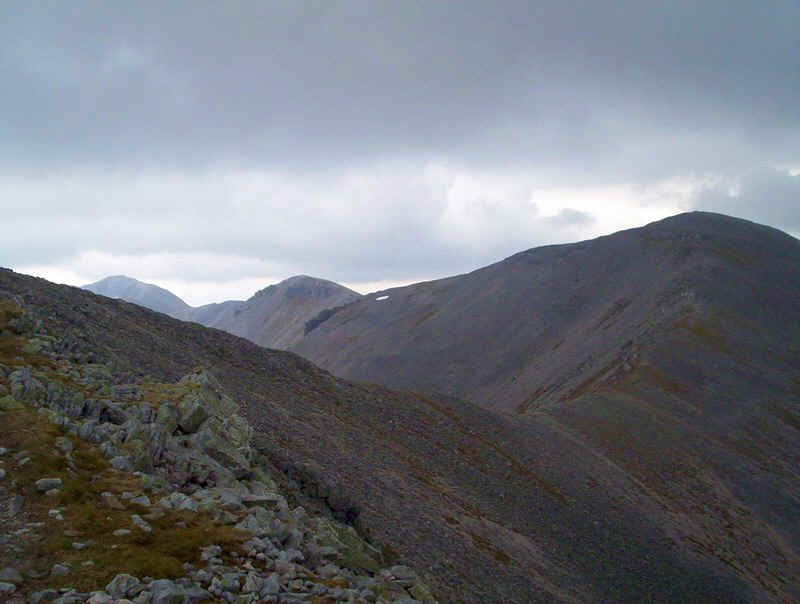 This photo is looking back downhill, from just below the col, and shows the Mamores across Glen Nevis. 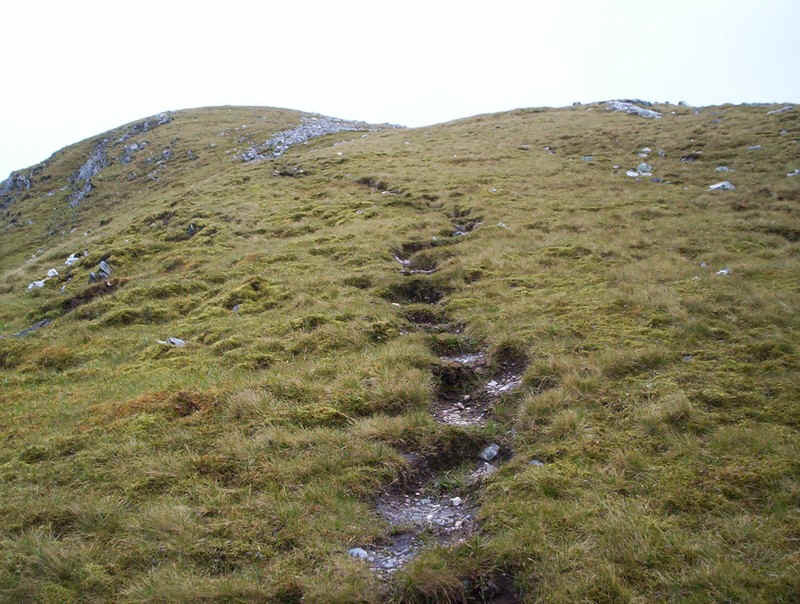 .......to reach the track. Fortunately, the cloud began to rise a little so views improved. 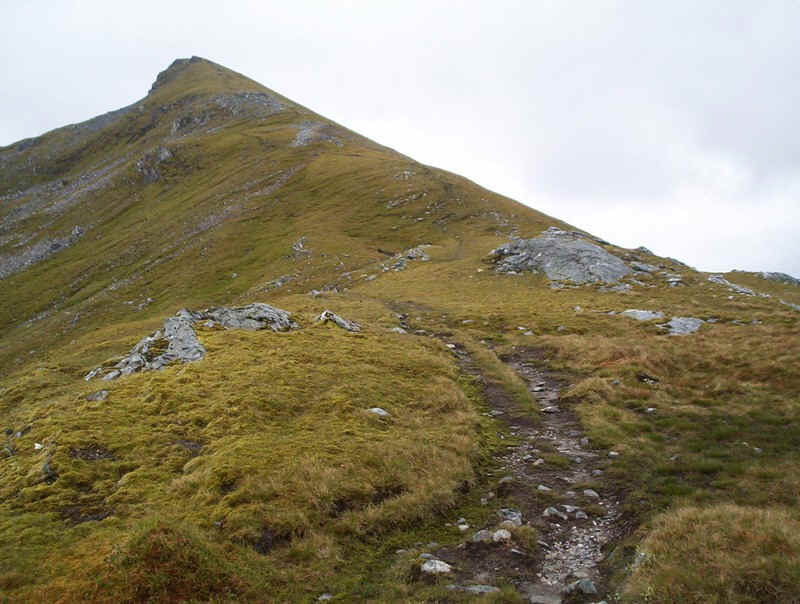 Ahead is the 963m high top of Sgurr Choinnich Beag. 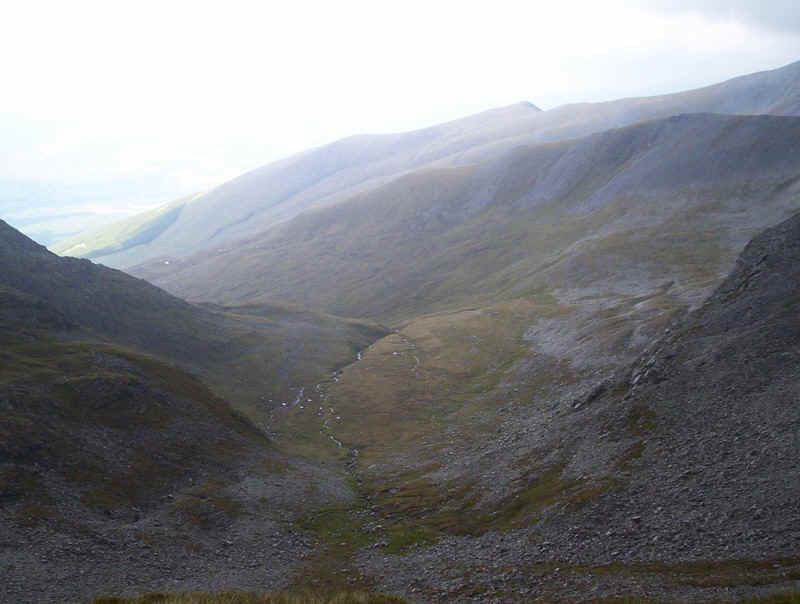 A glance backwards showed that the lower slopes of Aonach Beag were also clearing. The rock strata in its layers is particularly striking in this view. ......which is a grassy dome. 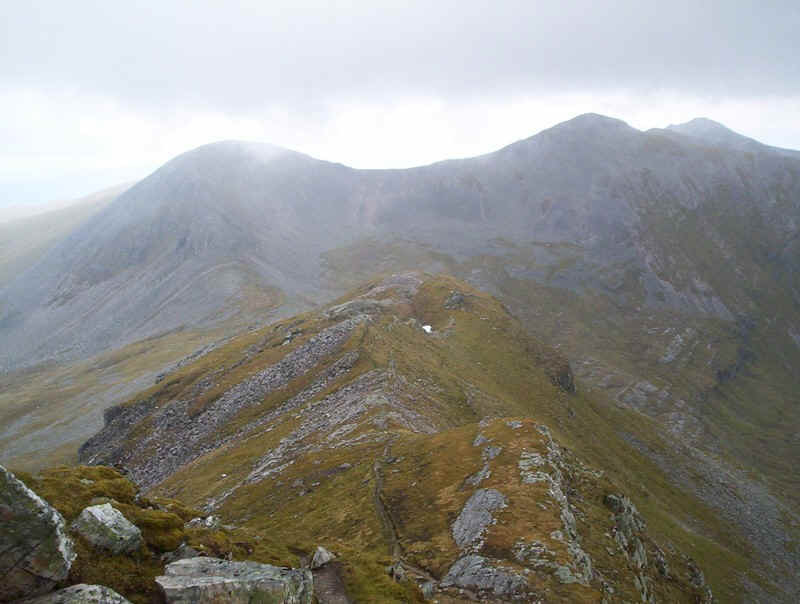 Beyond lies the first Munro of the day, Sgurr Choinnich Mor. 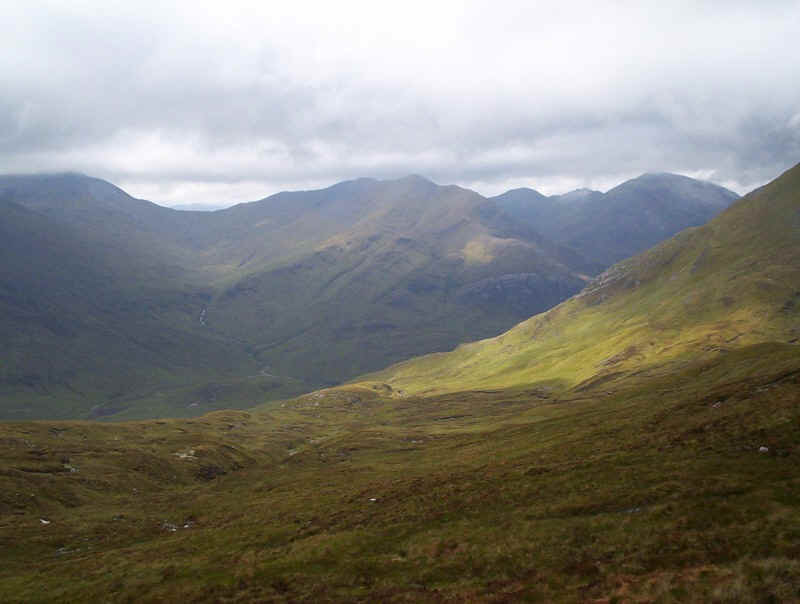 Over to the south, is the watershed between the Water of Nevis (on the right), which flows west to Loch Linnhe, and the wide Abhaninn Rath, which flows south east to feed Loch Treig (and the HEP plant of the Lochaber aluminum smelter). 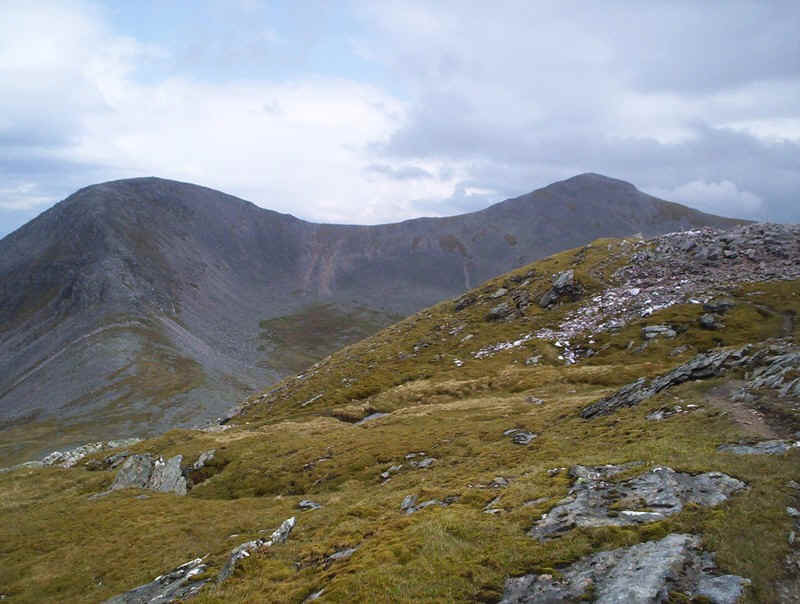 A curious band of rock is in the foreground, whilst across the glen are some of the Mamores that I hoped to climb a few days later. 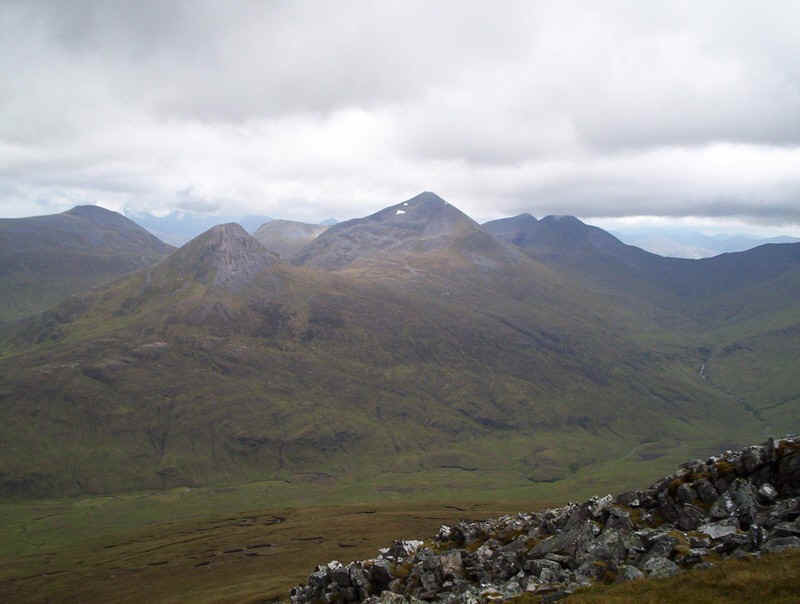 On the far right is Sgurr Elide Mor, while the lower conical hill is Binnein Beag, and the high hill in the centre with snow patches is Binnein Mor, Over to the right is Na Gruagaichean. 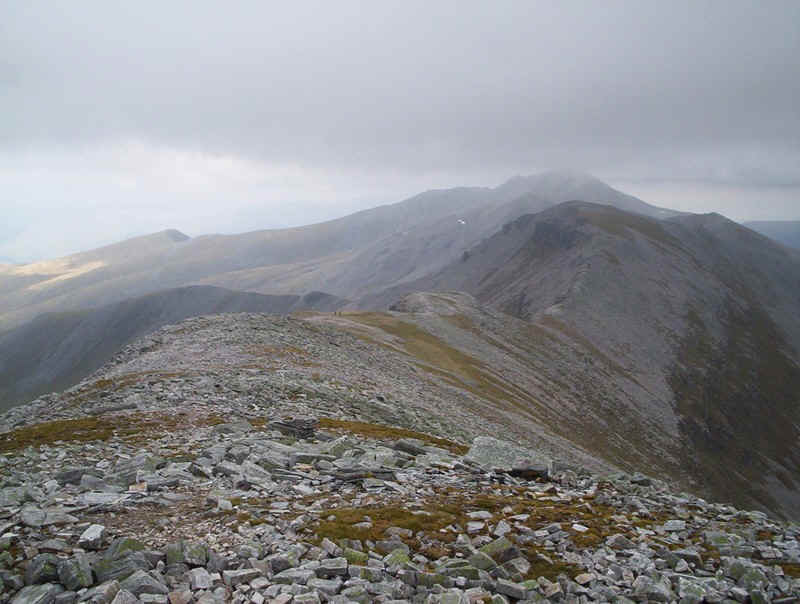 .......but a glance backwards shows Sgurr Choinnich Beag from the other side and the corries of Aonach Beag. 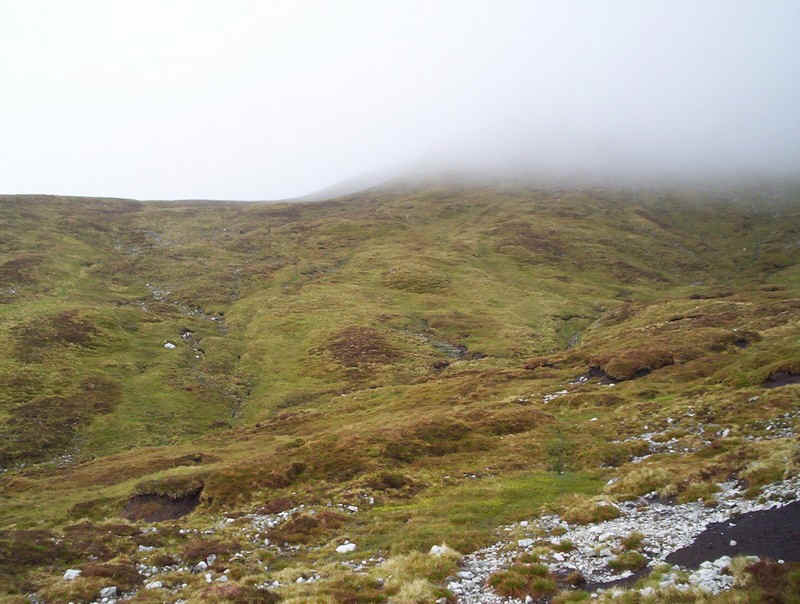 .......which, when the mist clears is rather narrow. 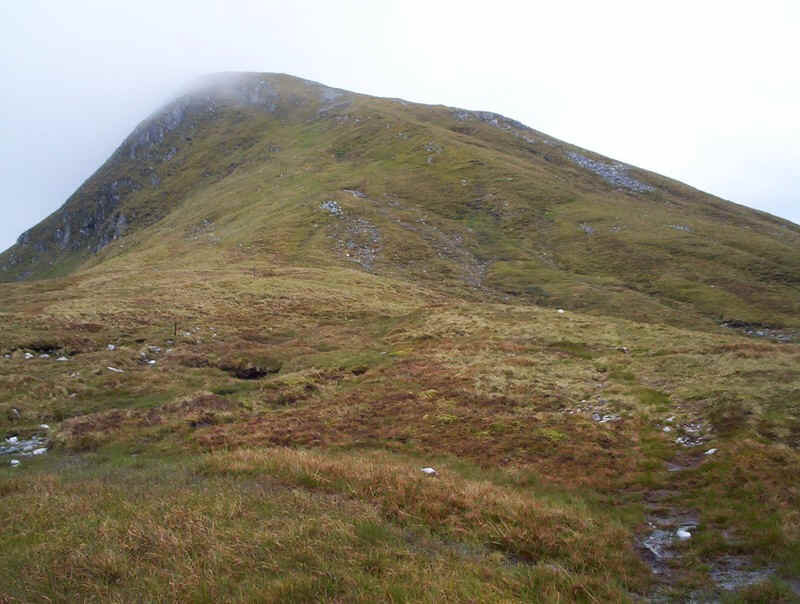 The climb to the first Munro of the day had taken just 4 hours, almost exactly the time suggested in the guide book so things, at this stage, were looking good. 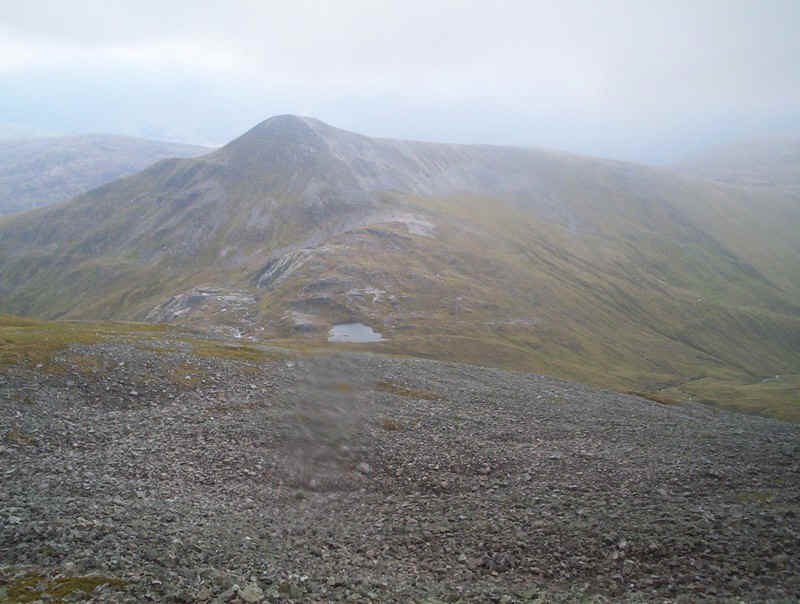 After a break for lunch, in a hollow near the cairn, it was off down the ridge, with the next two Munros of the day in view. 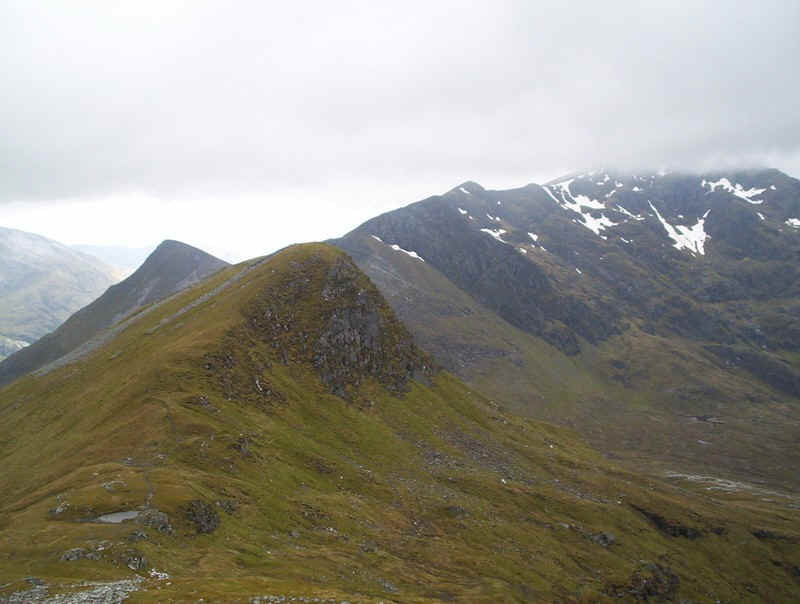 On the right is Stob Coire an Laoigh and, beyond, Stob Choire Claurigh. Of course in between me and those hills lay several miles of rocky terrain, which were about to make life a little more difficult. 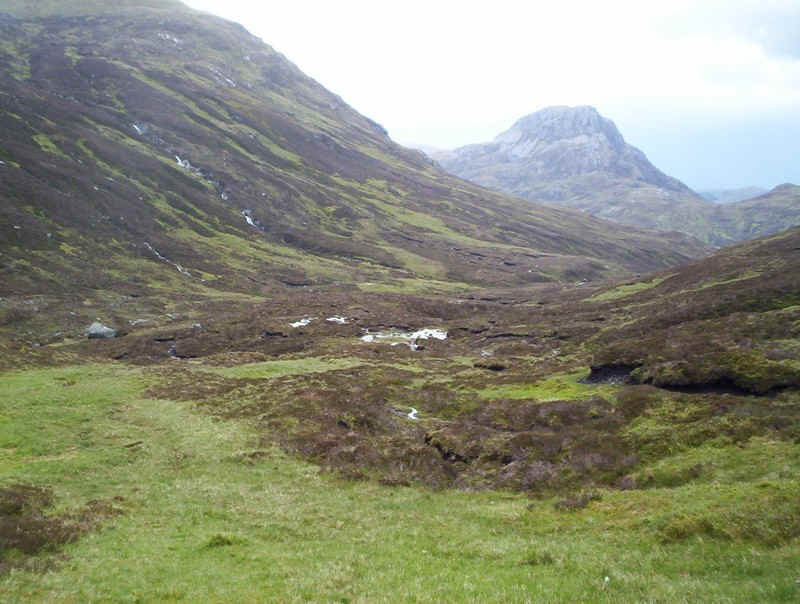 The path drops down to the Bealach Coire Easain, which can be seen in the centre distance of the photo. 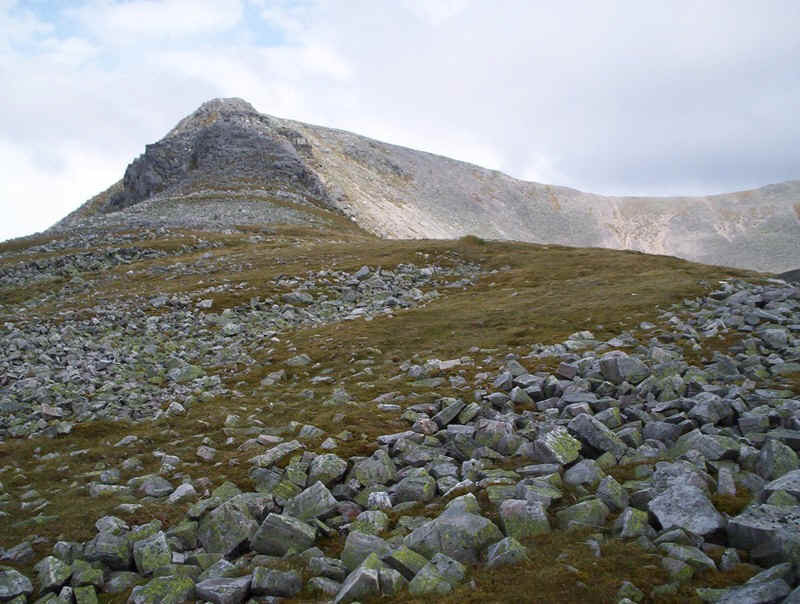 The Grey Corries are nothing if not rocky, but I'd hate to stumble down this in the dark or when there's a snow bridge over it! 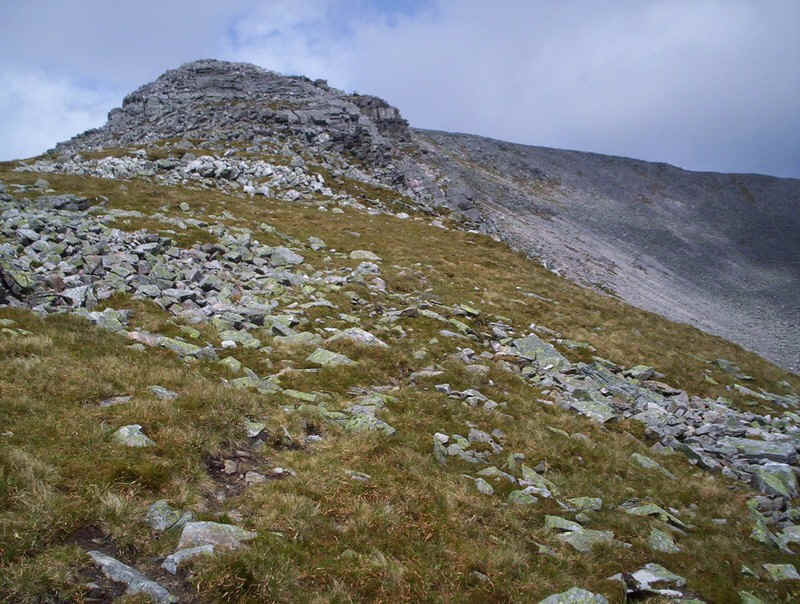 The sweep of the ridge around Coire Easain becomes obvious as the path drops down to the col.
Underfoot the way is getting stonier and rougher. 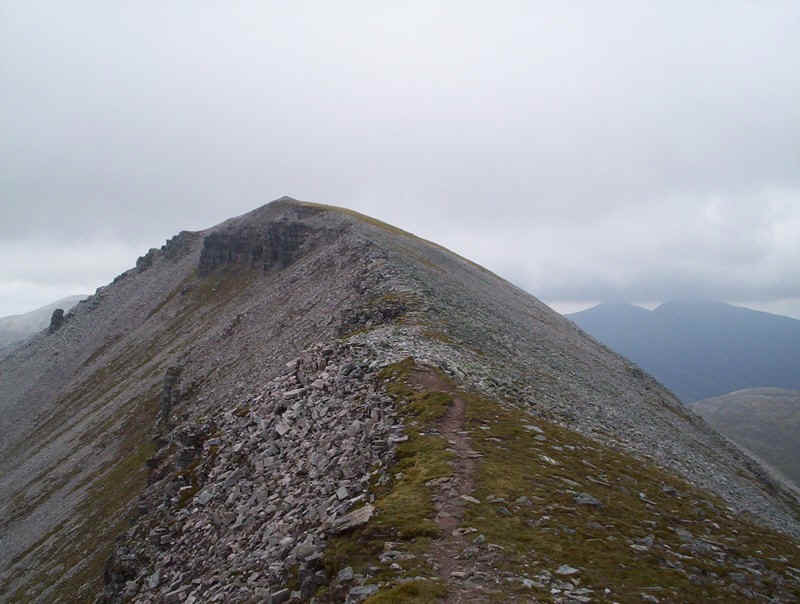 This is looking back to Sgurr Choinnich Mor narrow ridge. 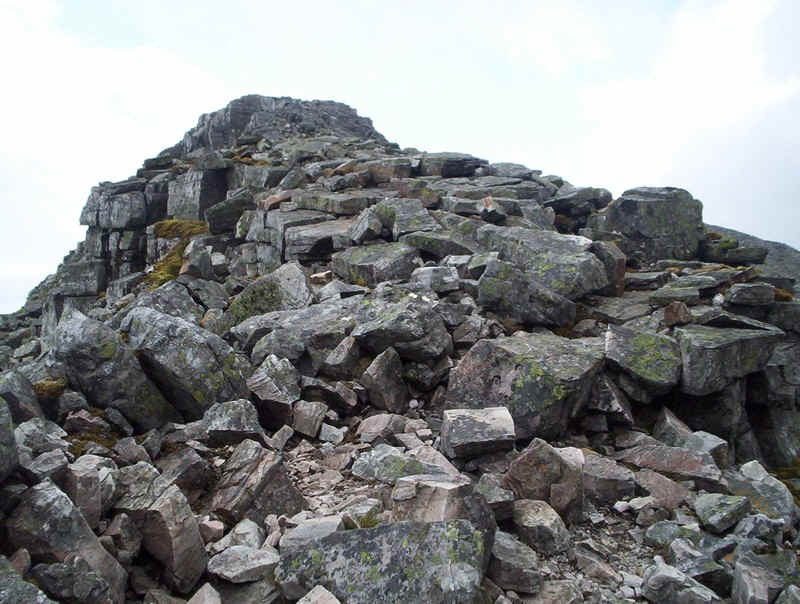 It's becoming clear that the way up to the next top at Stob Coire Easain is going to be interestingly rocky. 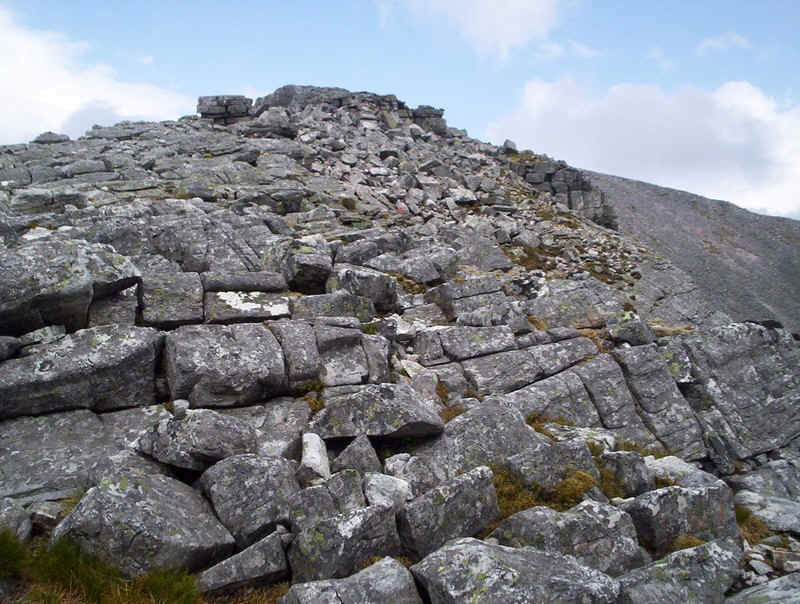 Getting down to the col at Bealach Coire Easain also required careful hand and foot work with a certain amount of bottom work as well. 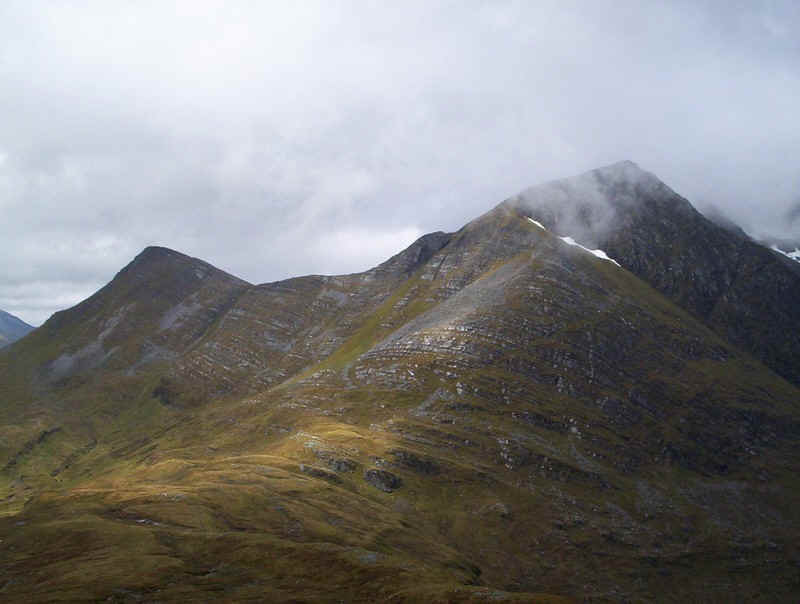 By now the cloud had lifted, although it was quite windy and there were much better views across to Aonach Beag. 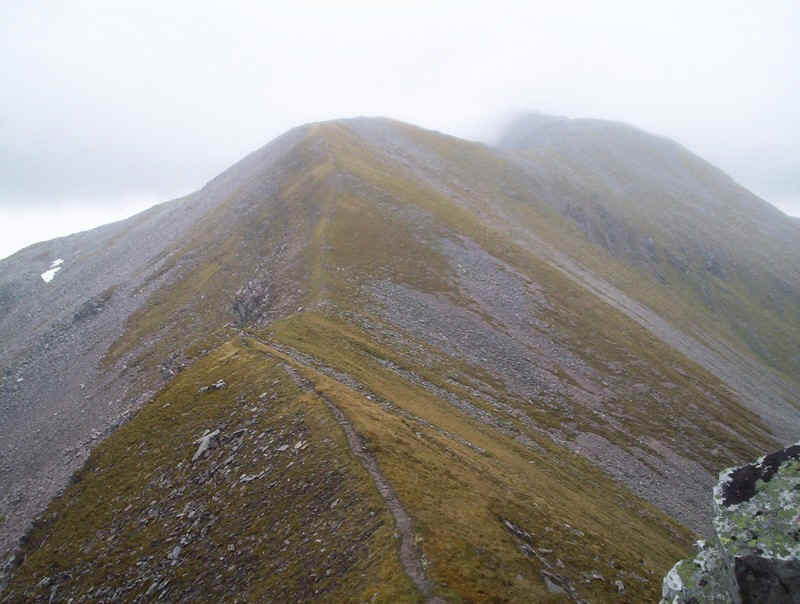 .....before the start of the climb to Stob Coire Easain - shouldn't this be a separate Munro? 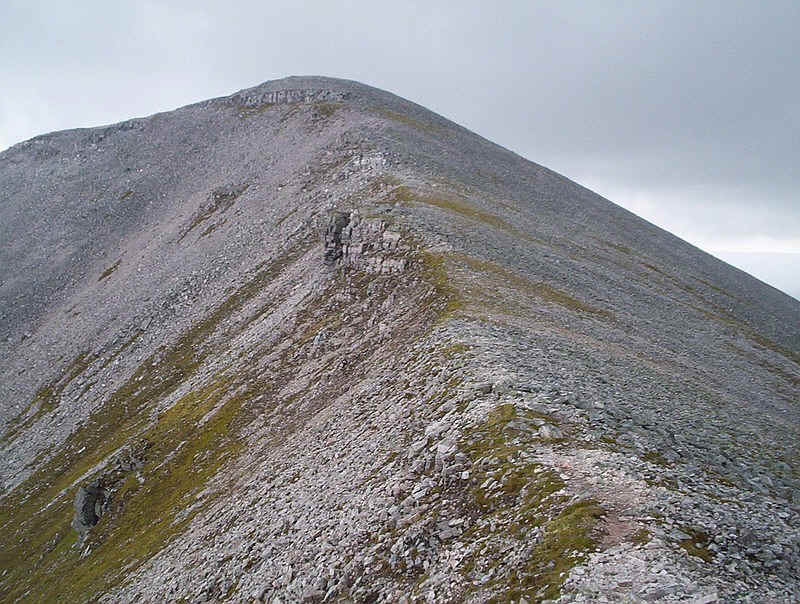 It looks like a separate hill to me. Click on this photograph to see a panorama. 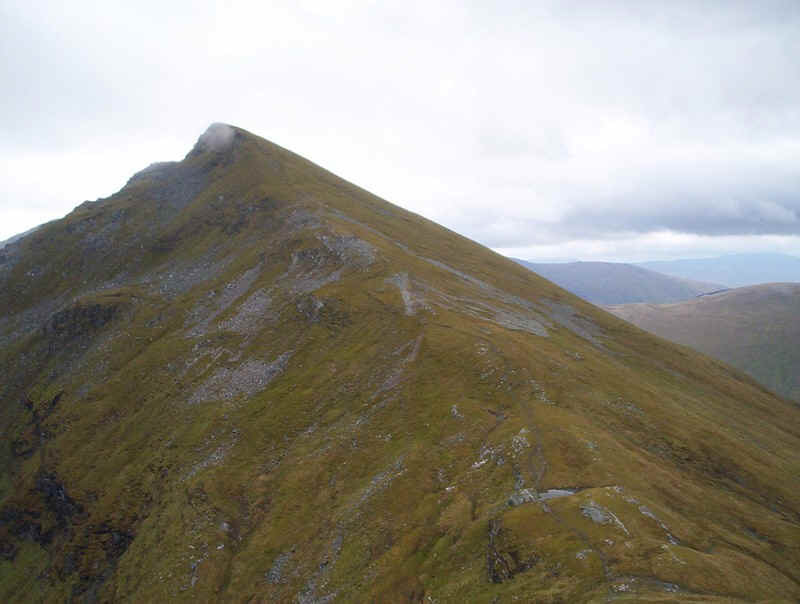 This is looking back at Sgurr Choinnich Mor from the col. It was becoming obvious that timing was not quite what I'd expected. 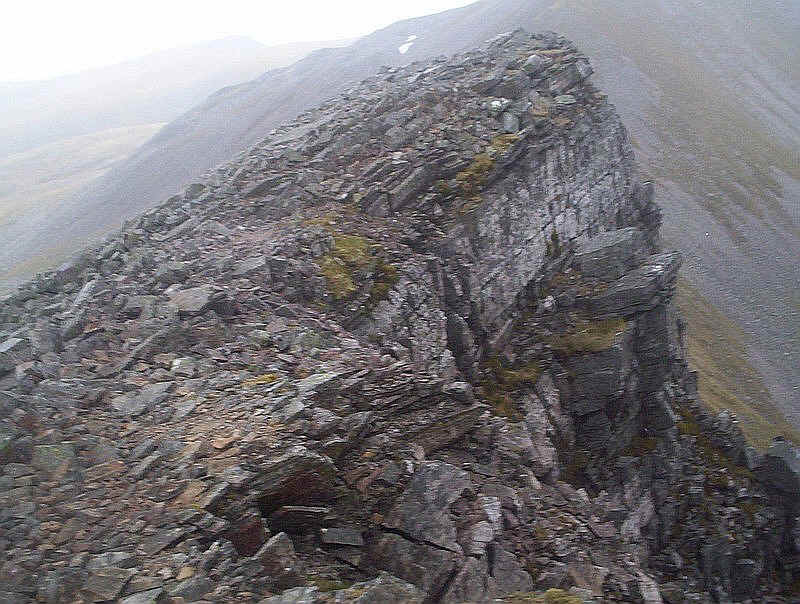 It had taken nearly an hour to get down from the summit of Sgurr Choinnich Mor. 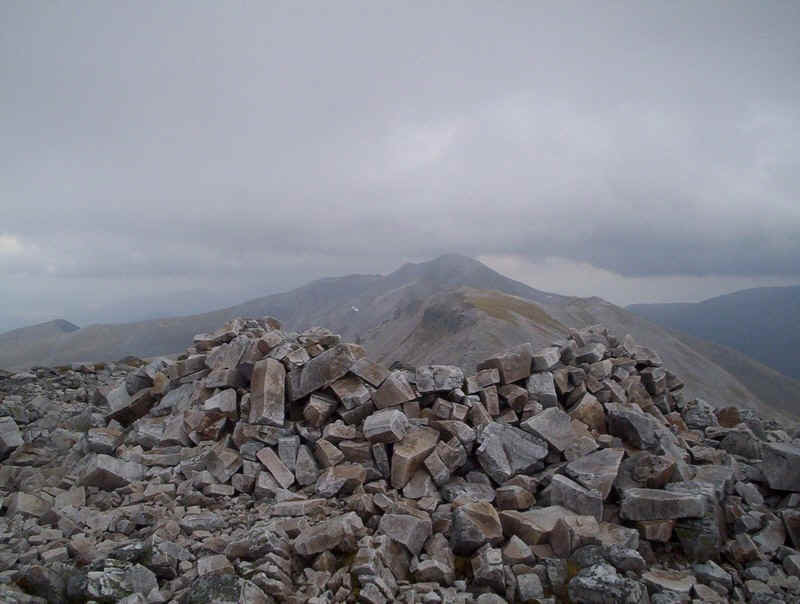 As I climbed the slopes of Stob Coire Easain I was beginning to wonder how I was going to get up those rocks. As you get closer the walker is suddenly confronted with this amazing sight. ...and was actually rather enjoyable, although in a few places erosion has broken the layers of rock into boulders. 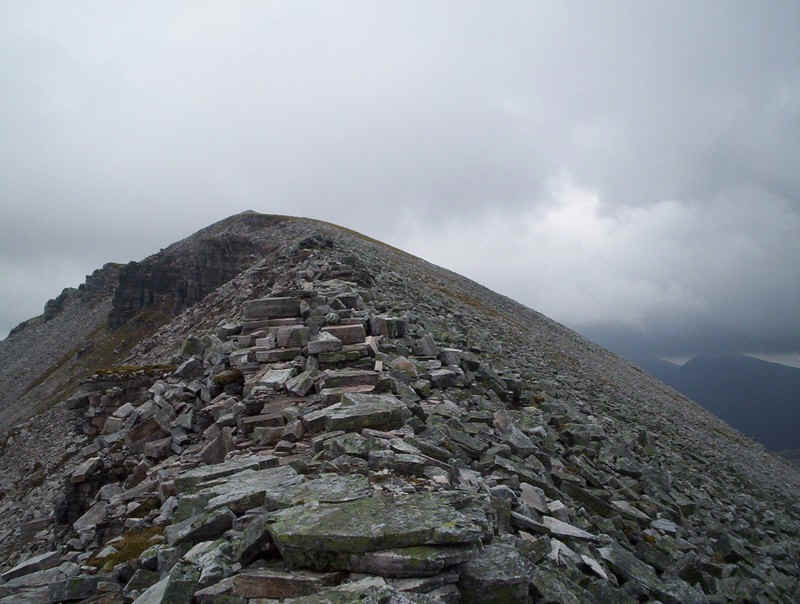 .....and the cairn (1080 m) with the main ridge running out in front. 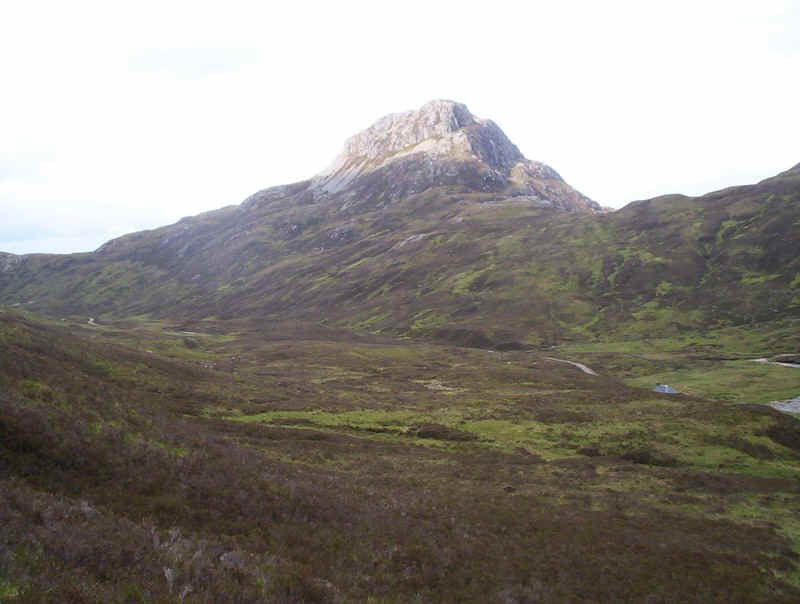 However, by now I was running about an hour later than expected and I'd already decided that the chances of climbing Stob Ban were almost zero. 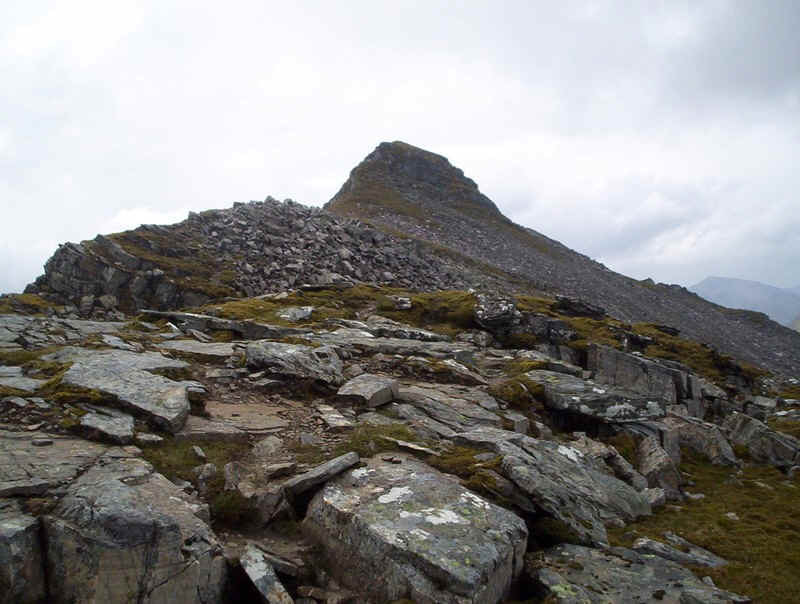 .......rising steadily up to Stob Coire an Laoigh. 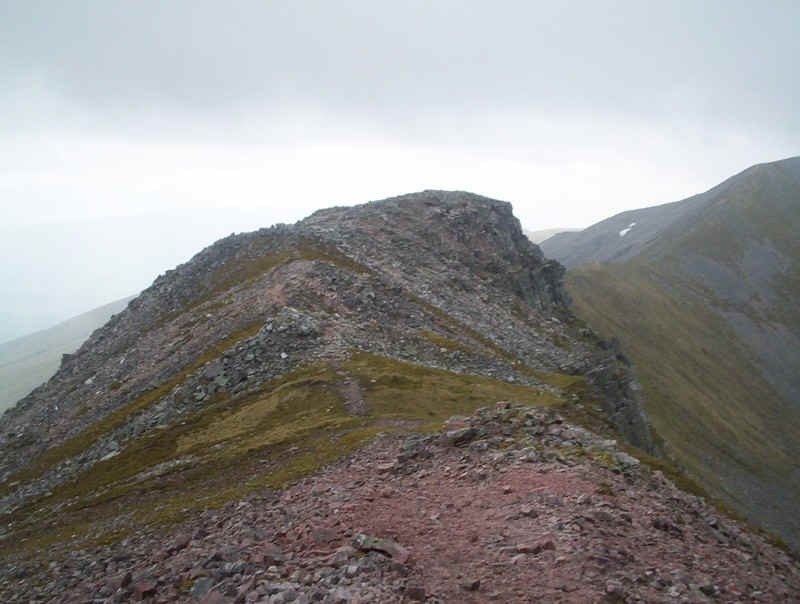 There's an interesting double corrie on the north side of Stob Coire an Laoigh. 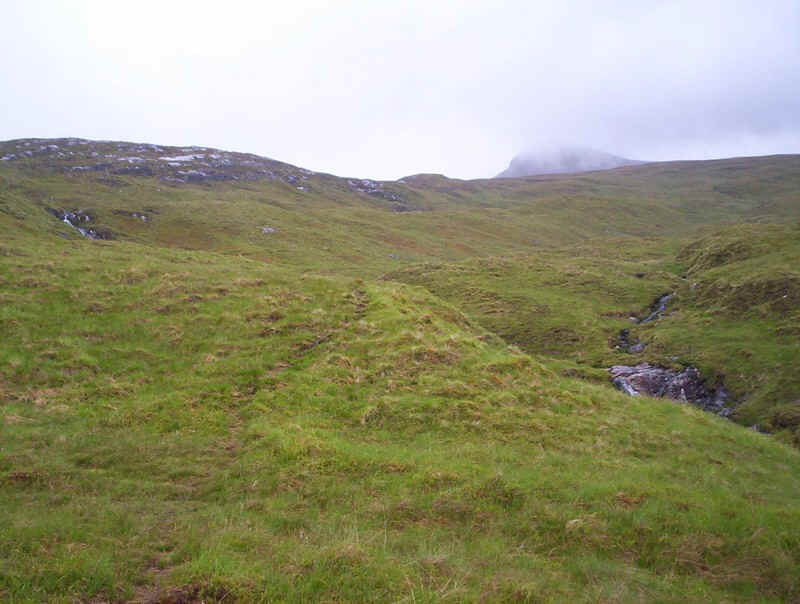 This is the more westerly of the two and is split from the other corrie by the ridge of Sron an Lochain, which can be seen sloping down to the left. 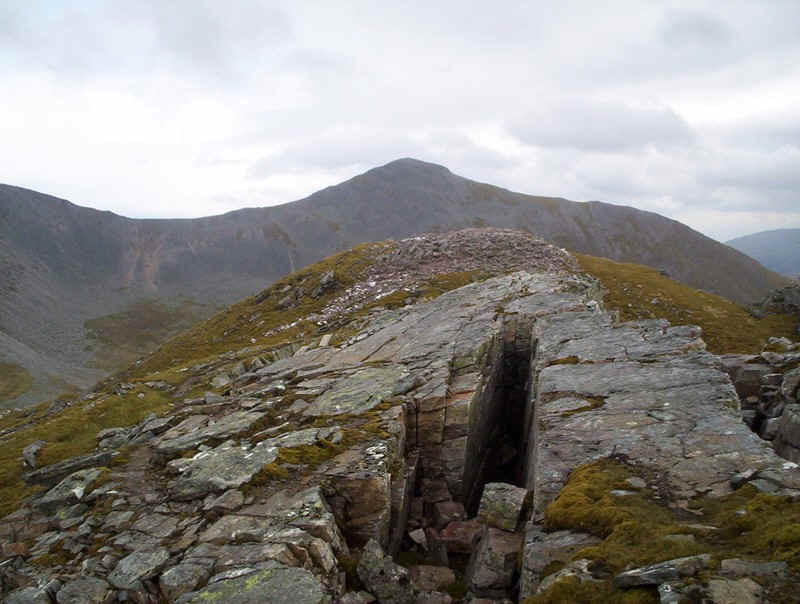 The summit of Stob Coire an Laoigh (1116m) has a cairned shelter. 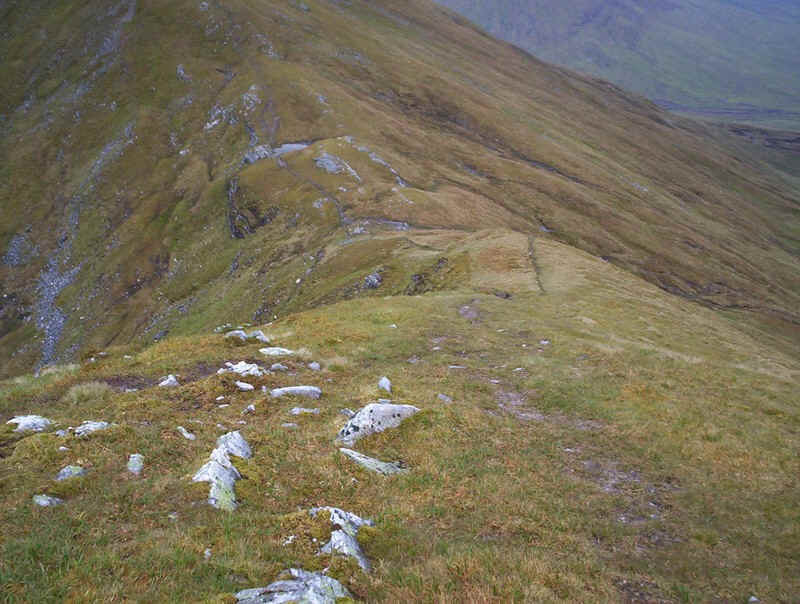 Up to this point the walk had taken 6 hours from Glen Nevis. 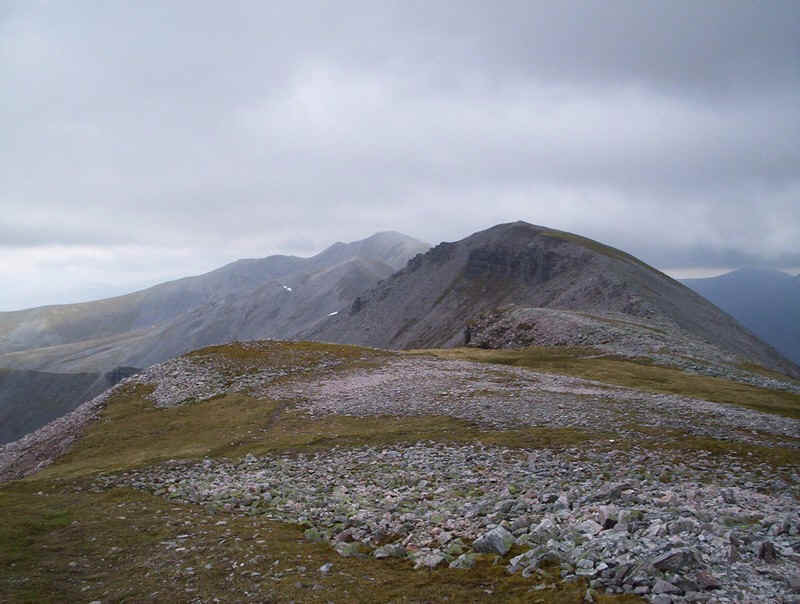 Beyond the summit the Grey Corries ridge continues over several smaller summits towards Stob Choire an Claurigh, seen as the high point in the distance. 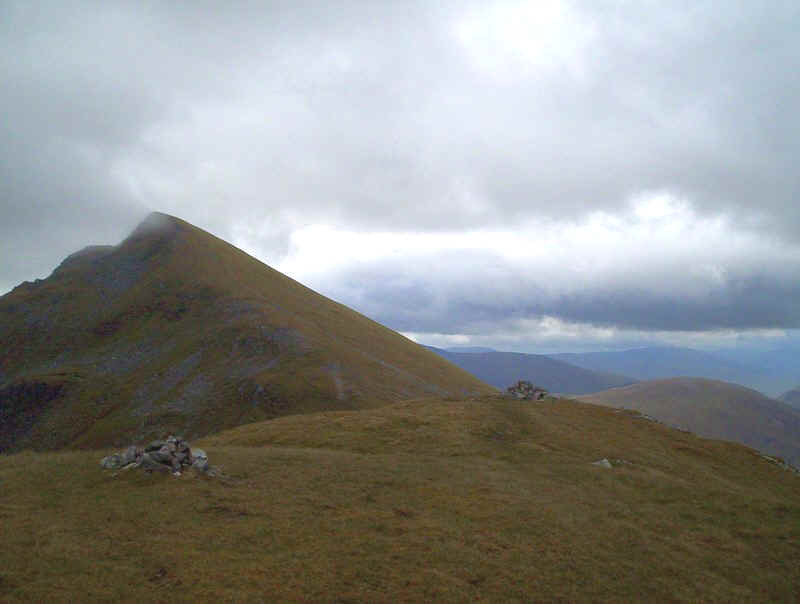 I met two walkers ( they're in the middle of the ridge) who were doing the same walk, but in the opposite direction. 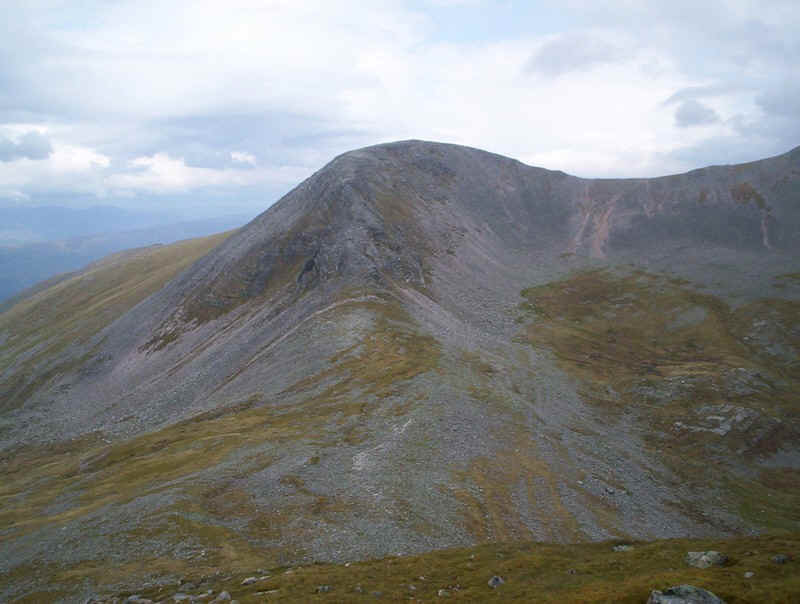 They gave me some useful tips about paths later in the walk and mentioned that the scree slopes on Stob Ban were difficult. 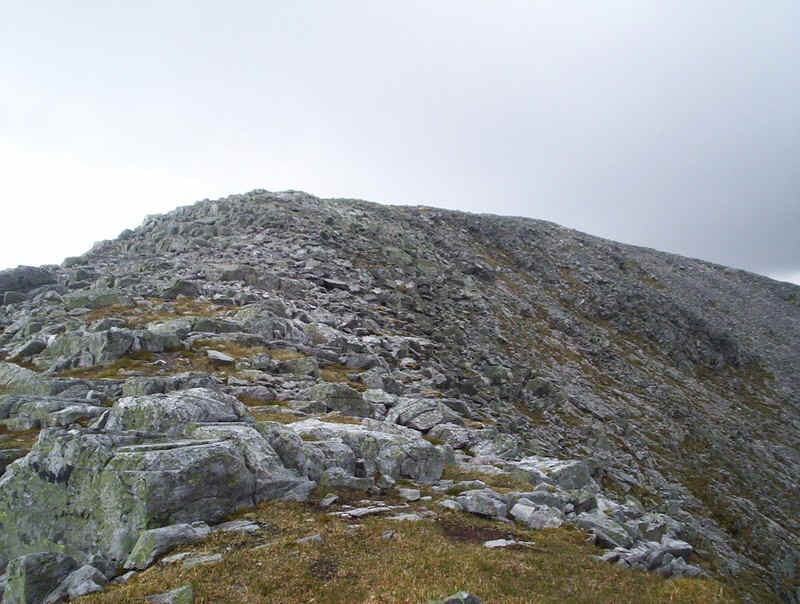 ......but soon it's back to rock on the climb on this narrow ridge. The rocks here are arranged almost like a pavement, but with drops on either side I was glad it wasn't windy or wet. 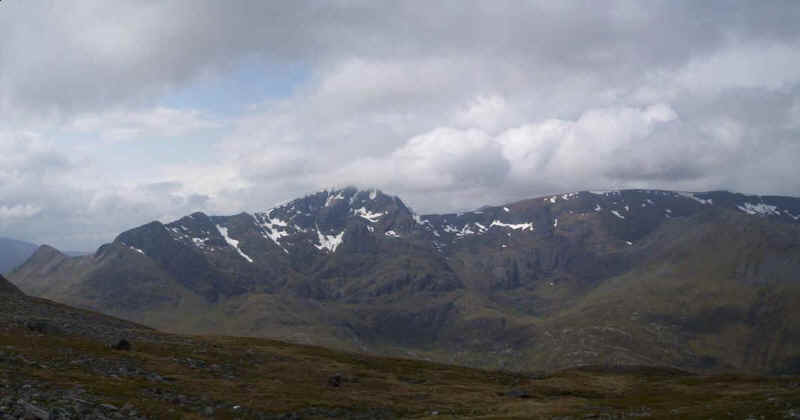 Looking back with some fearsome looking cliffs and Stob Coire an Laoighh beyond. 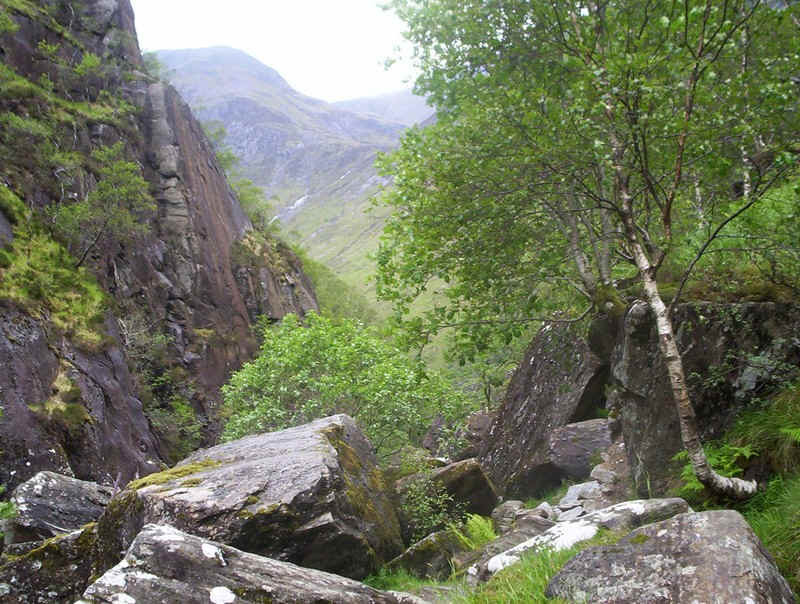 ...to the cliffs at Caisteal (castle). 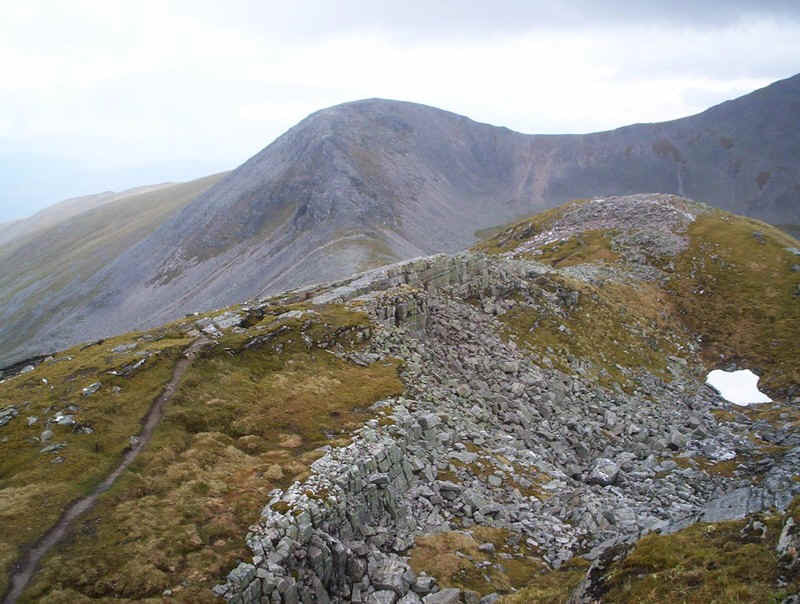 One feature of this walk is the variation in colour and types of rock. ....emerges onto another short section of grass. 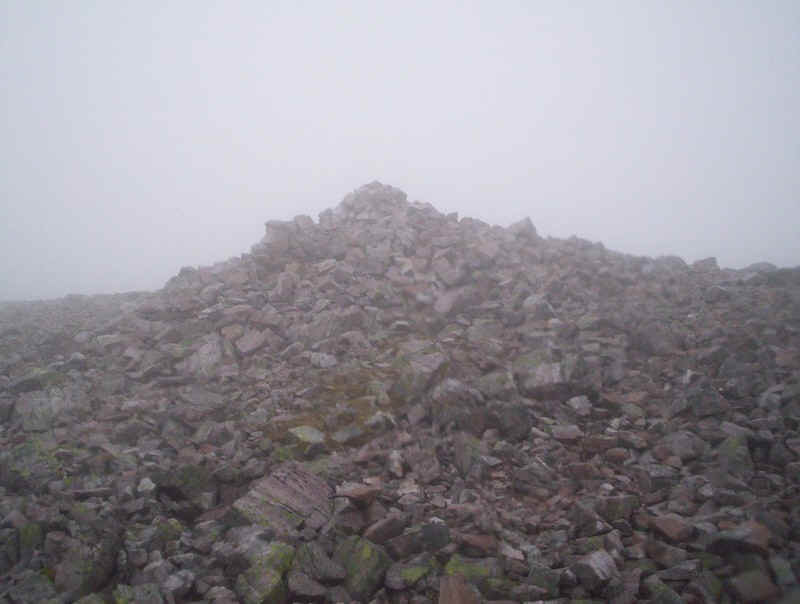 ......the summit cairn of Stob Choire Claurigh (1177m) and the high point of the day. 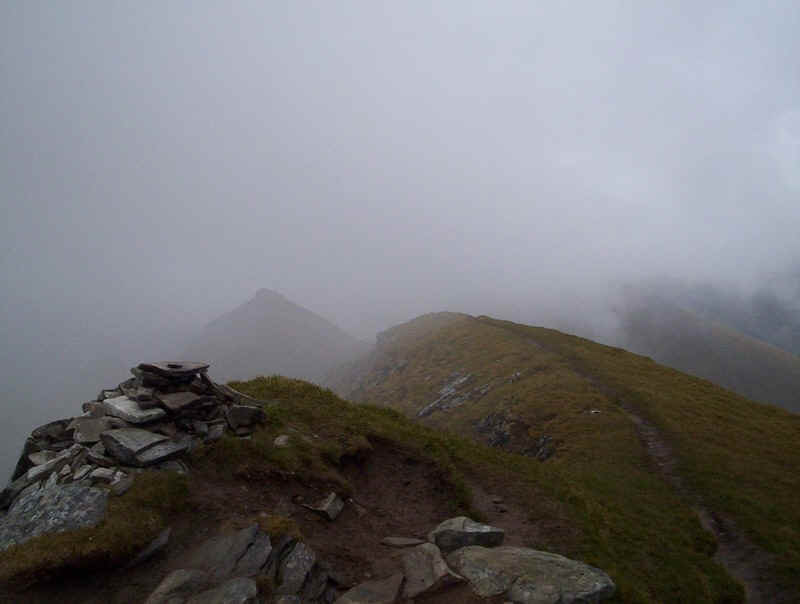 Sadly, the cloud came down just as I arrived, so there were no photos of the views from here. 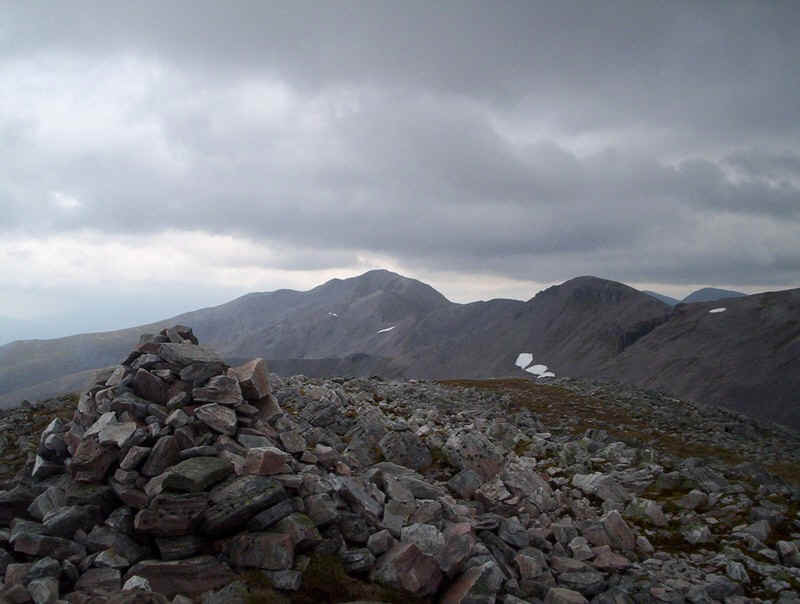 It had taken 7 hours and 40 minutes from Glen Nevis and was now 4.00 p.m. 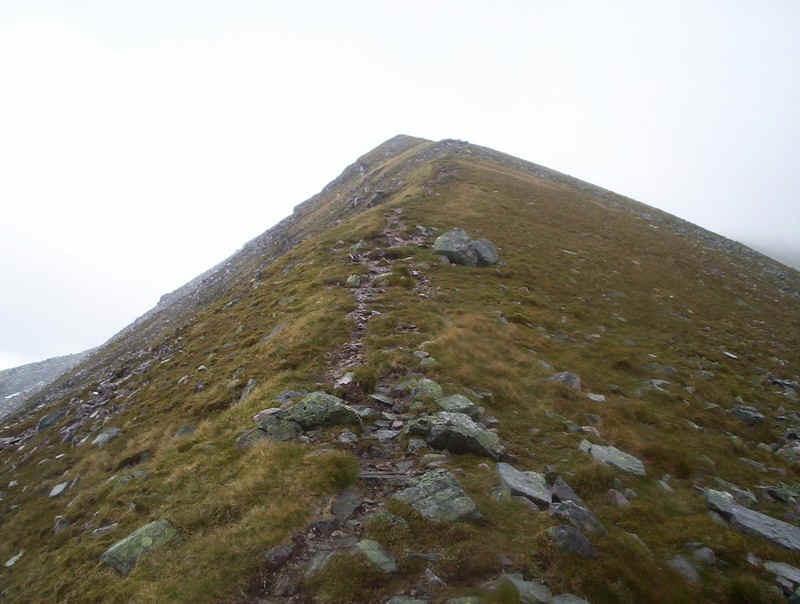 However, my walking time from Stob Choire an Laoigh was probably only about 10 minutes more than expected so my progress along the actual ridge had been quite good. 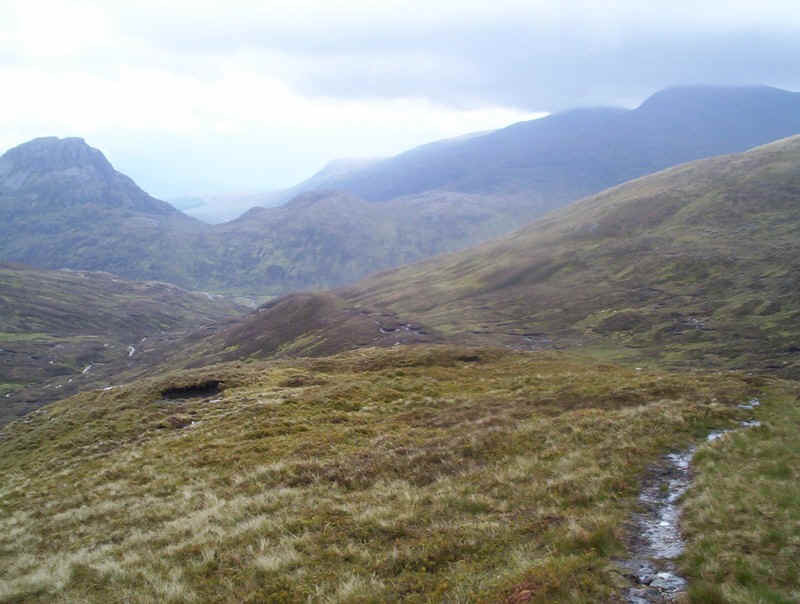 After a brief food and drink stop it was time to descend to the valley; all thoughts of climbing Stob Ban had been banished. 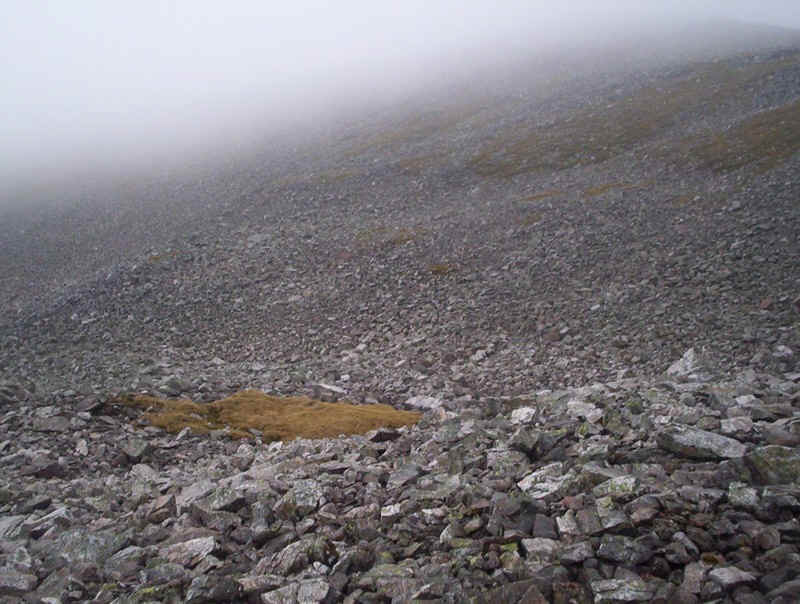 Just to make matters difficult the mist lingered and I had to pick my way very carefully over the quartzite blocks that litter the side of Stob Choire Claurigh. 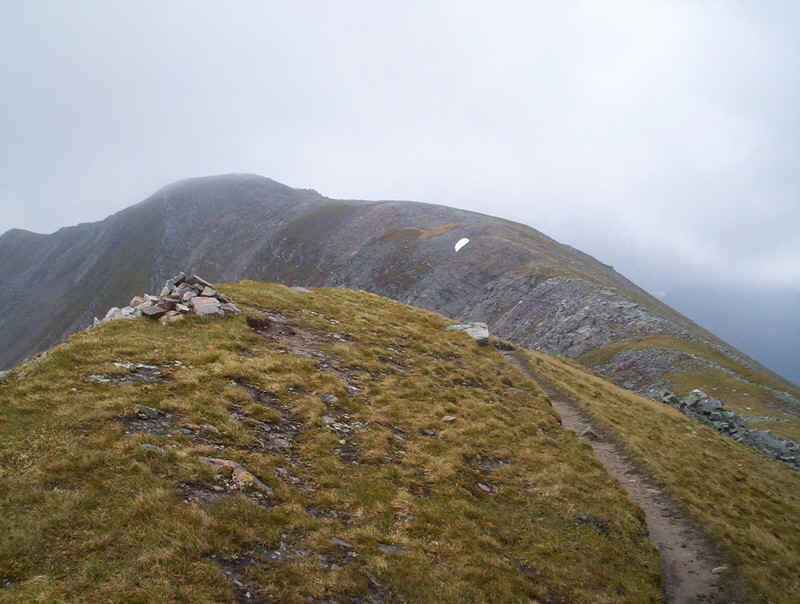 Up to this point I'd really enjoyed the walk but the hour it took me to descend, very carefully, to the lochan in the col between Stob Choire Claurigh and Stob Ban was rather testing of my enthusiasm for boulder hopping. Yes, that's what you have to come down (or go up). Lovely! 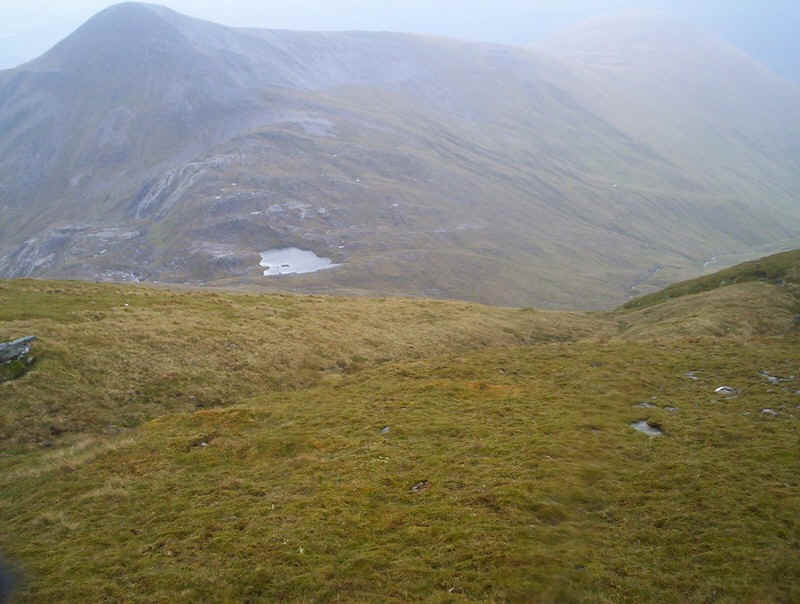 Eventually, grass was reached but the lochan is still a long way down. 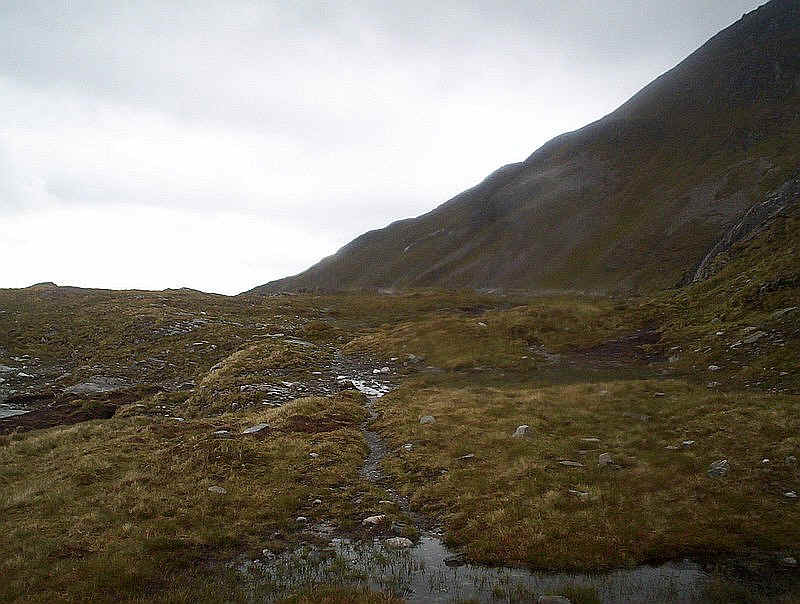 Down at the lochan, one hour after leaving the summi,t and as it was now 5.00pm I was beginning to wonder if I'd be in Spean Bridge in time for a meal. 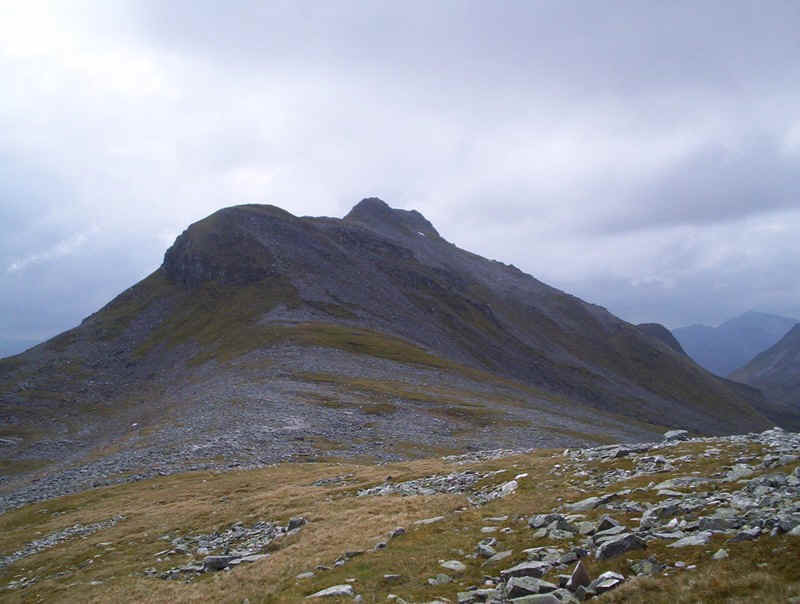 Stob Ban and its steep scree slope can wait for another day. 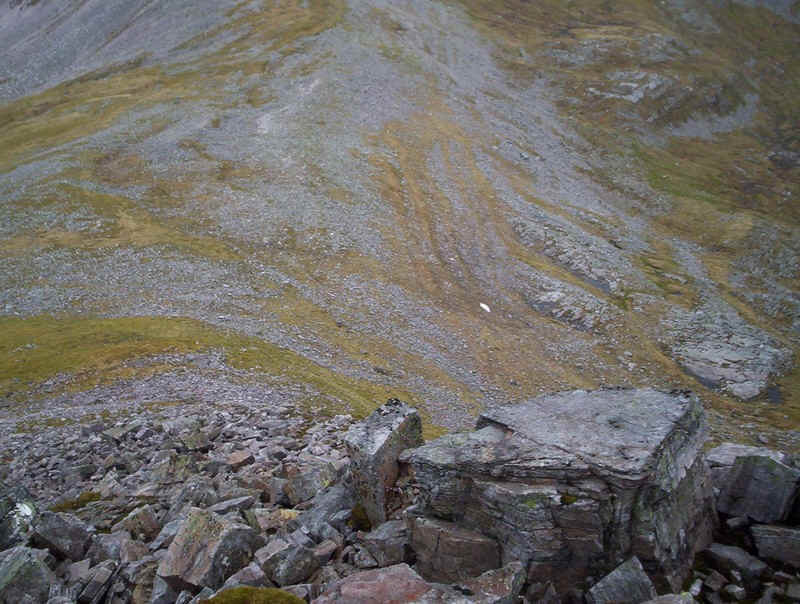 .......and then across grass before it disappears on rock slabs just before one of the burns that come off Stob Ban. 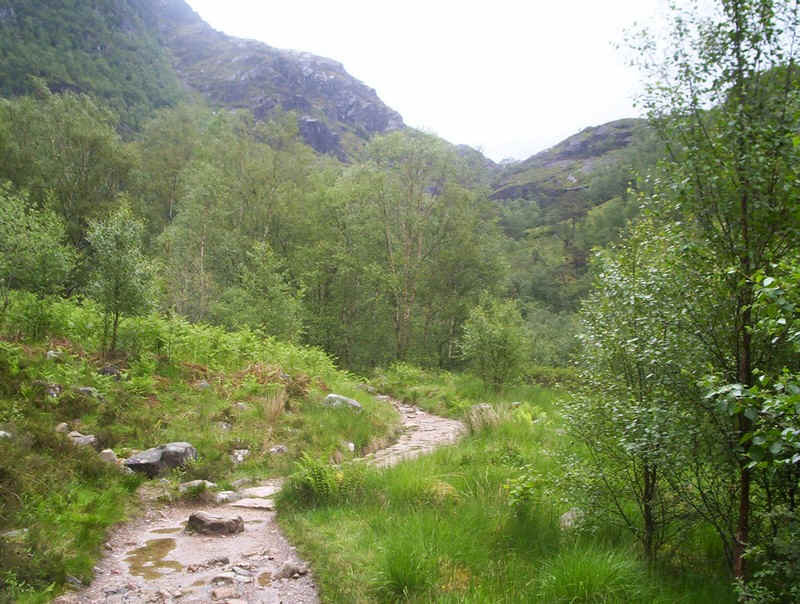 On the other side of the stream the path re-emerges and is very clear almost the entire way down into the glen. 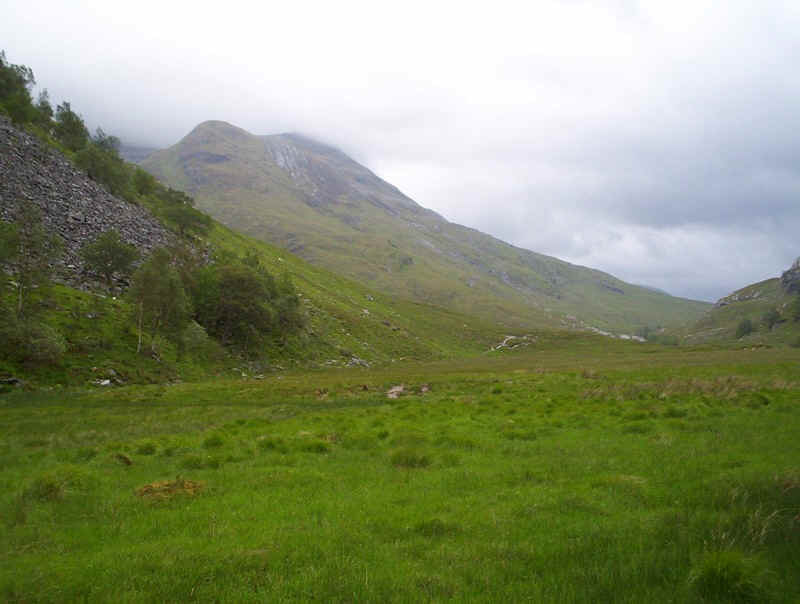 It was something of a relief to be walking along a soft track and over grass after the hours of rock. .....which was easily crossed. 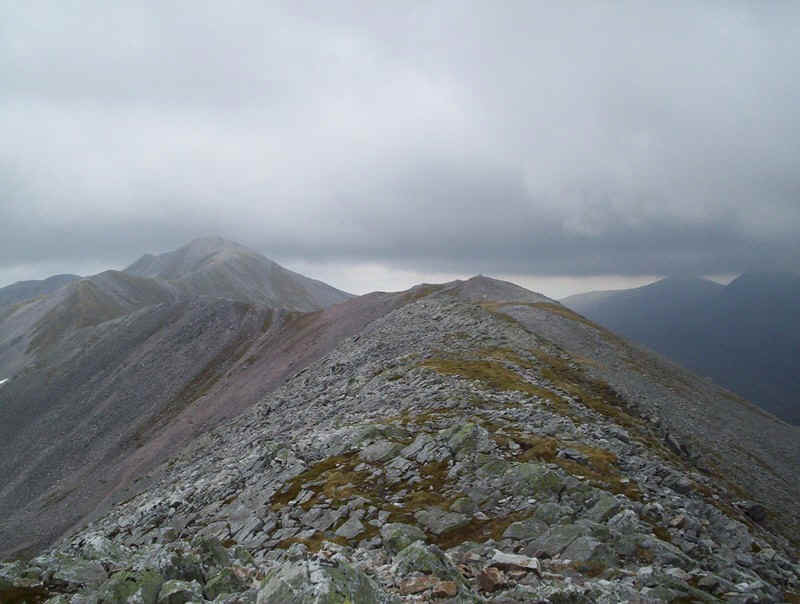 Here is a final look back at Stob Ban. .......get down to the valley 'road' slightly faster. 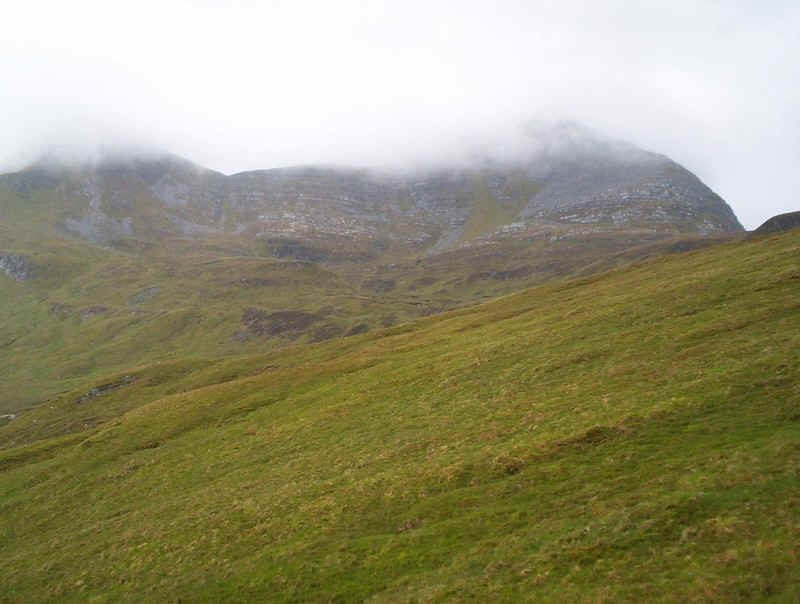 Directly ahead is the Corbett Sgurr Innse and, just visible, is the roof of the bothy at Leacach, which had a couple sitting outside. 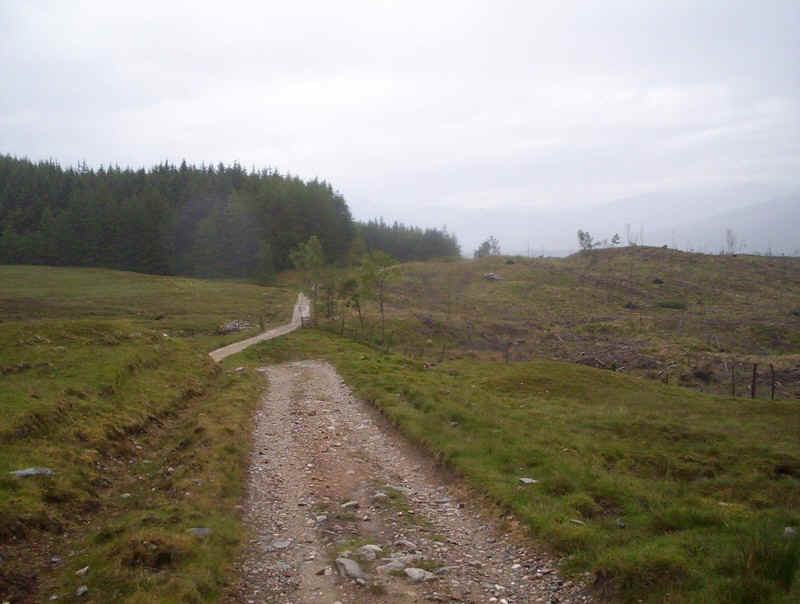 Anyway it was now 6.10pm and time for the 12km yomp back to Spean Bridge. I reckoned I needed to be there by 8.30 to stand a chance of a meal in one of the pubs. 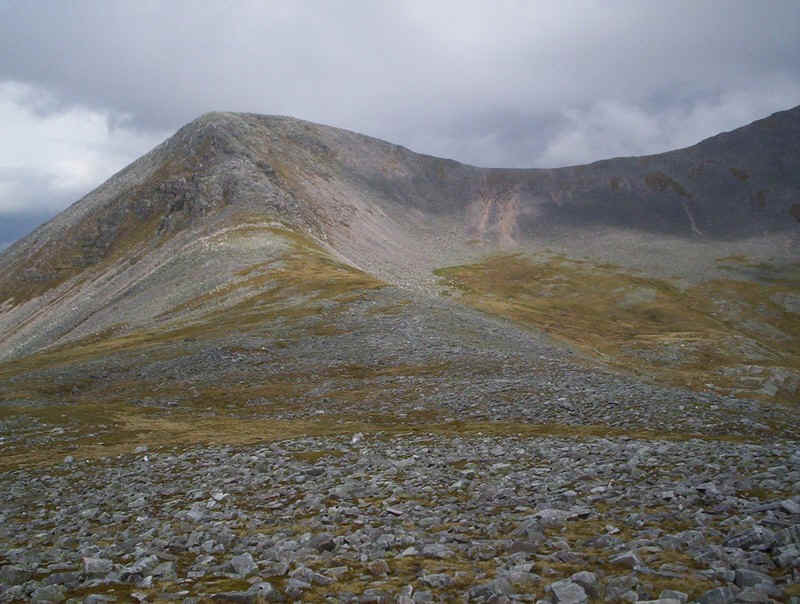 ....and then falls to the forest at The Lairig. 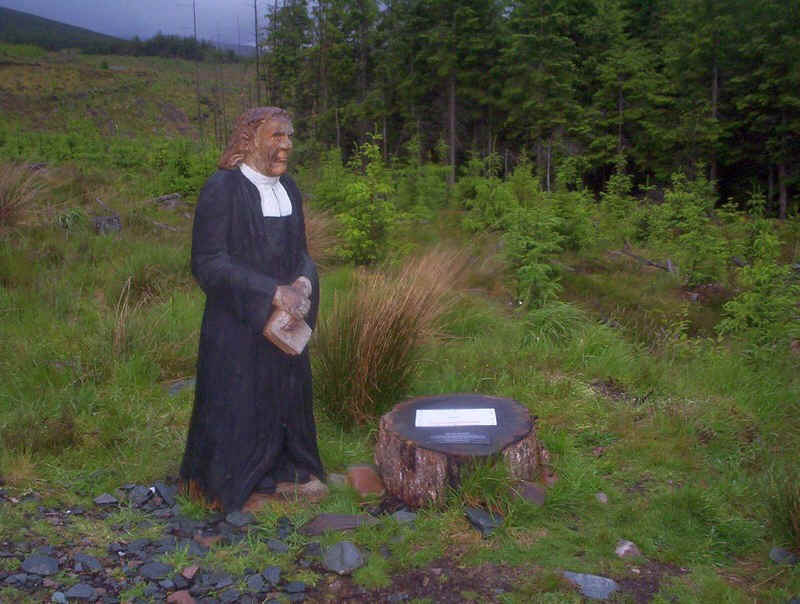 The Wee Minister who brings good luck to climbers and walkers. Well he'd obviously helped me so I took a photo of him. Beyond this point the light was too bad for photos. 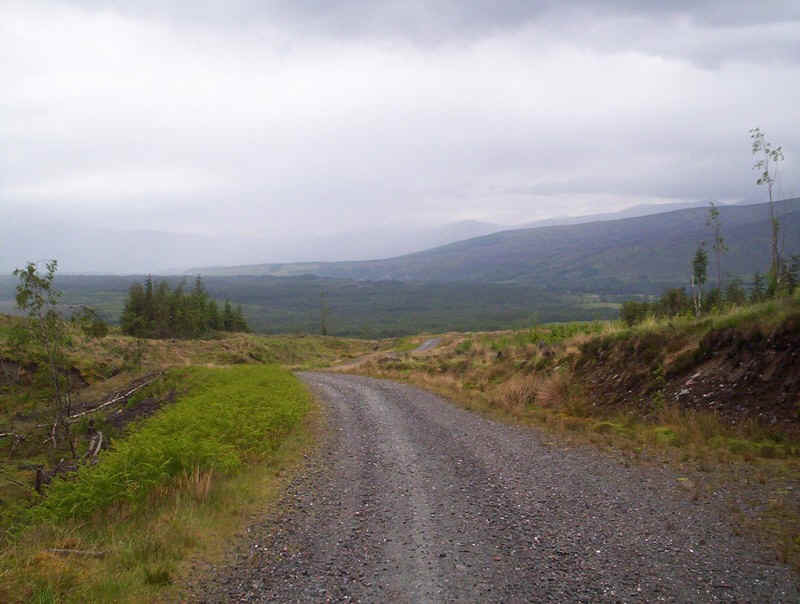 I was almost at Spean Bridge when a car drew up behind me and offered me a lift into the village. "The best place for a meal is probably at the station restaurant," she said so we went hurtling down the lane into the village. Sadly, they took one look at me and said it was too late for a meal. 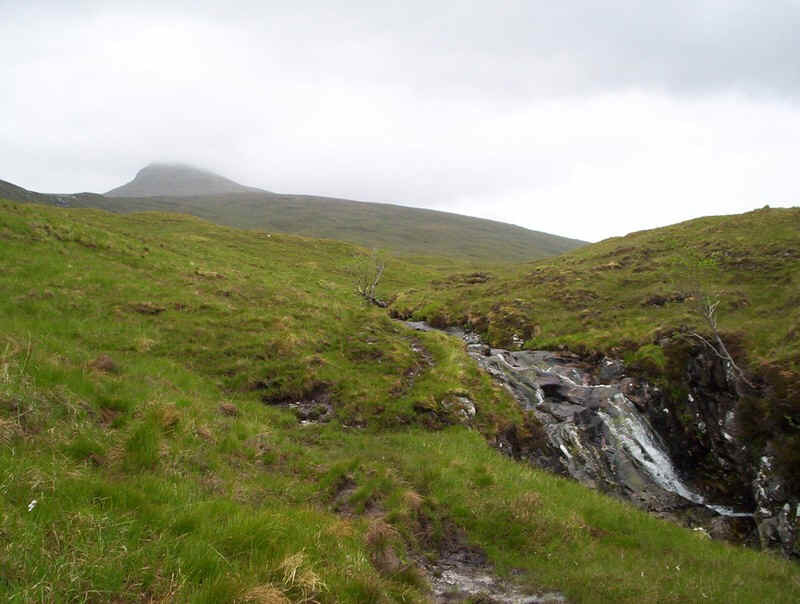 In the end it was the Commando Bar in the Spean Bridge Hotel for soup and fish and chips. 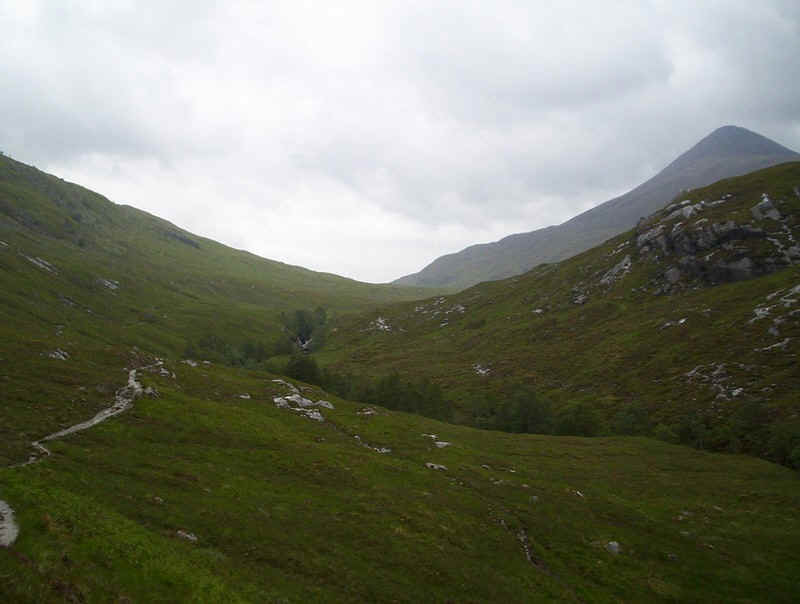 ScotRail delivered me back to Fort William just after 10.00 pm. A great day, but how can those timings in the guide books be so hopelessly optimistic. Have the writers actually checked the timings or are they just relying on Naismith's Rule? 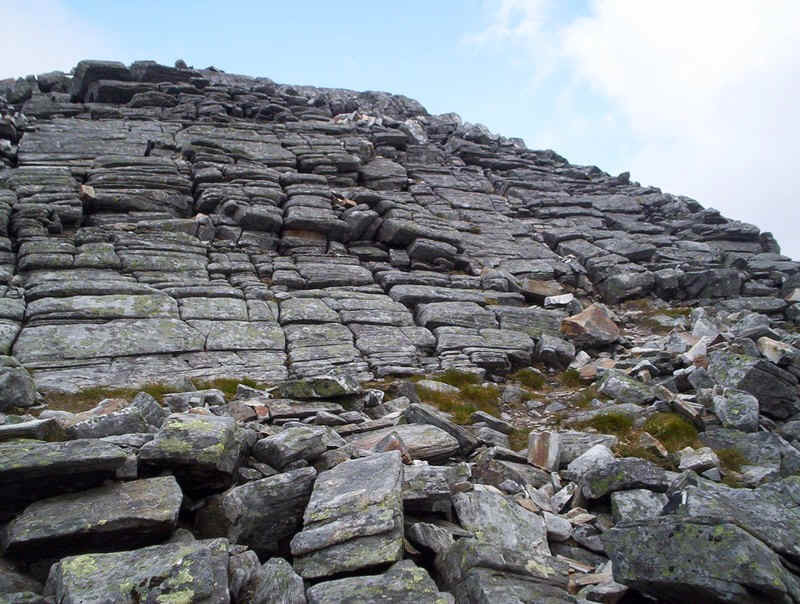 If this is so then, quite simply, Naismith's Rule doesn't work on terrain like this.